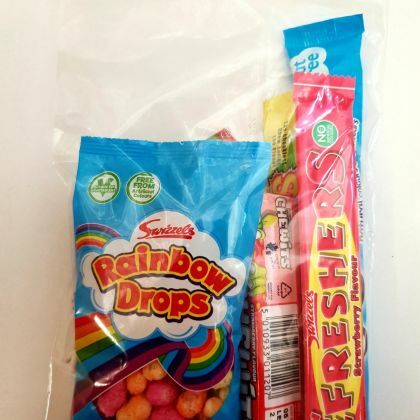 Pre-filled Basic Plastic Party Bags Pre filled plastic party bags. 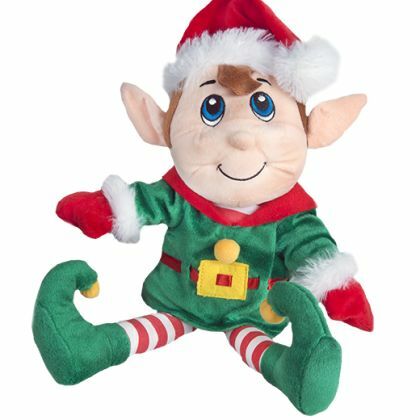 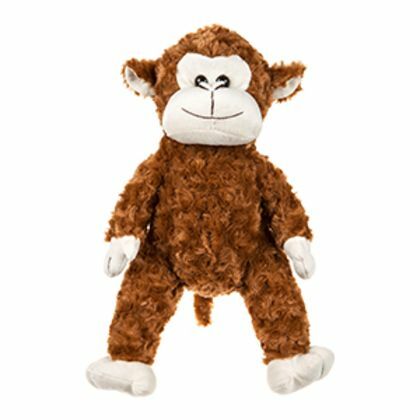 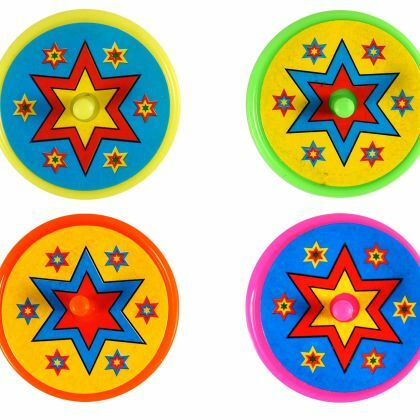 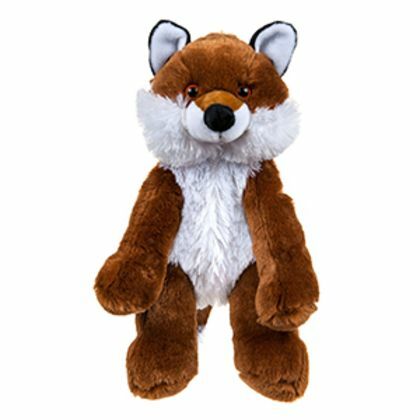 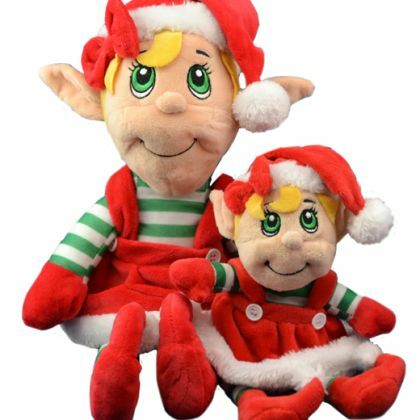 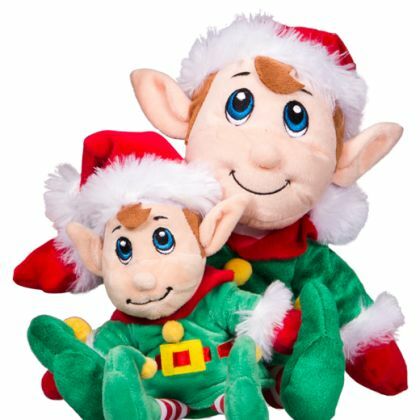 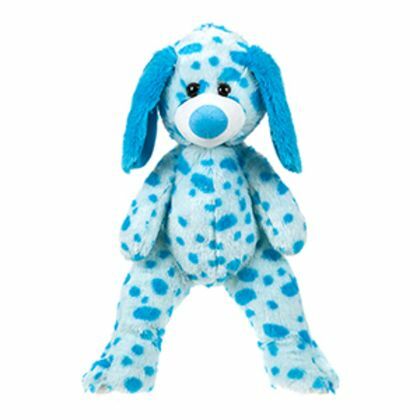 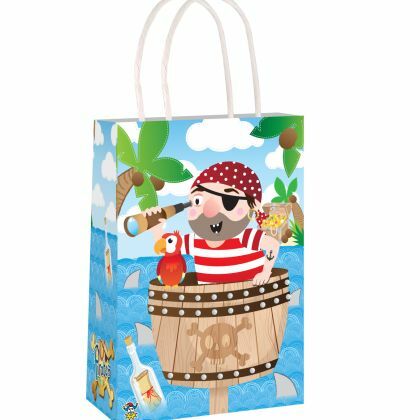 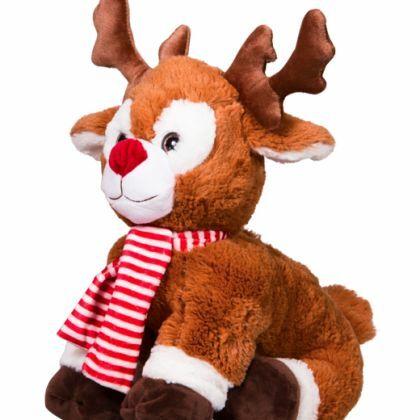 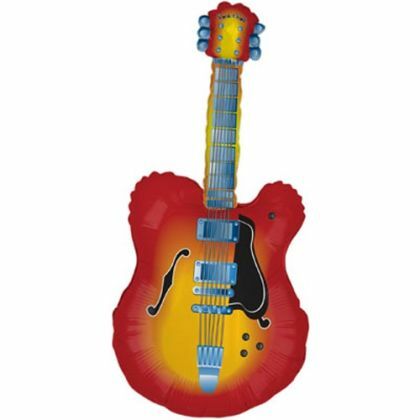 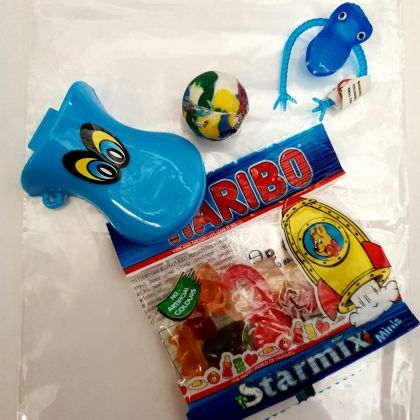 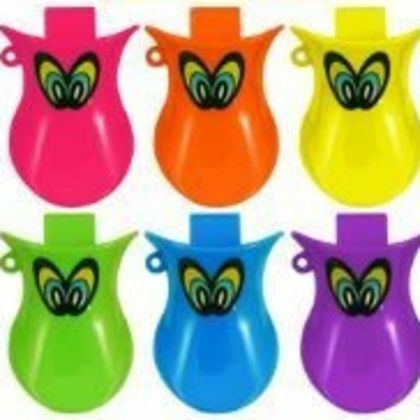 These come in your choice of bag.Each party bag comes with a mini bag of Haribo and then select how many toys you would like added as well - toys will be supplied at random and may not necessarily match the theme of the bag. 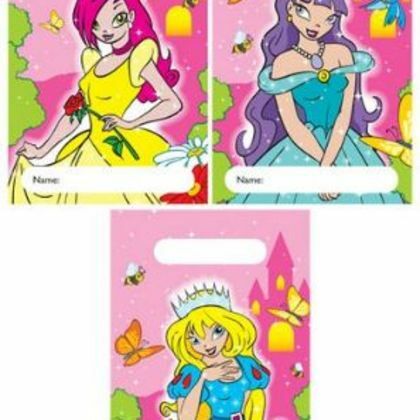 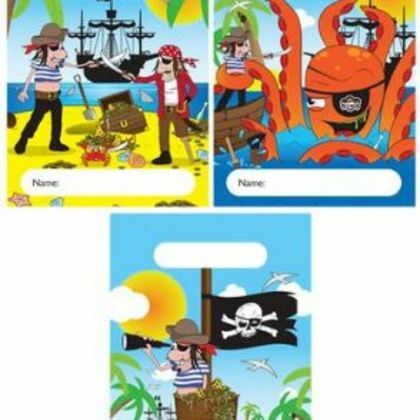 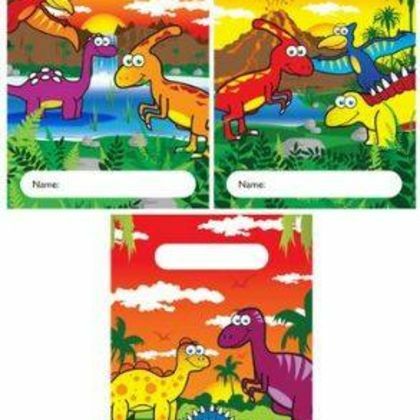 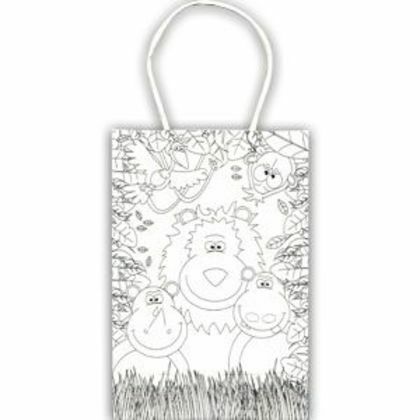 Pre-filled Plastic colouring Party Bags These come in your choice of bag. 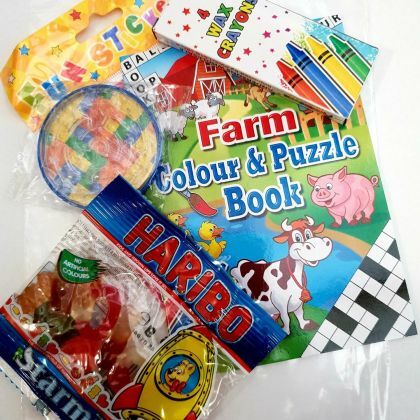 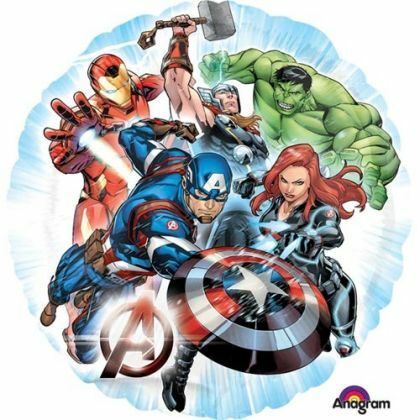 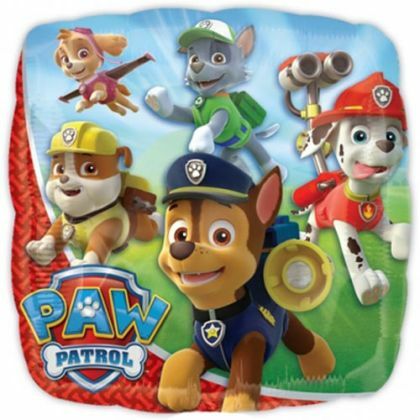 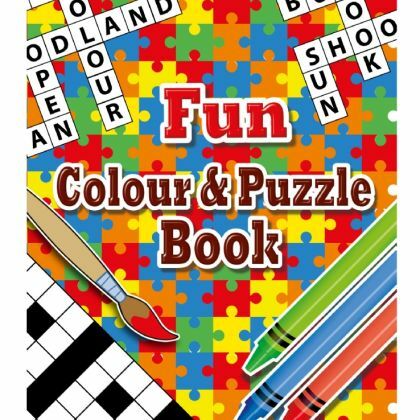 Each party bag comes with a mini bag of Haribo, colouring/puzzle book, crayons and then select how many toys you would like added as well - toys will be supplied at random and may not necessarily match the theme of the bag. 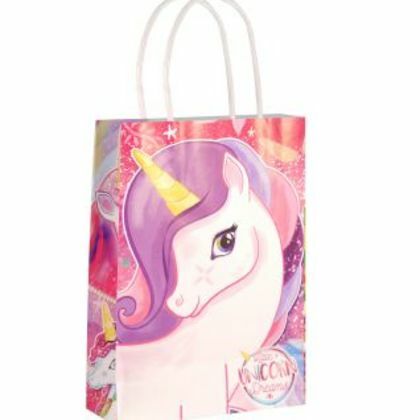 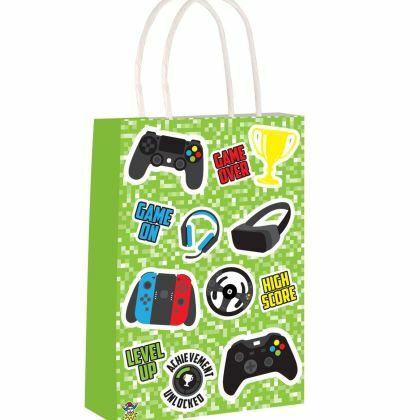 Pre-Filled Basic Paper Party Bags These come in your choice of bag. 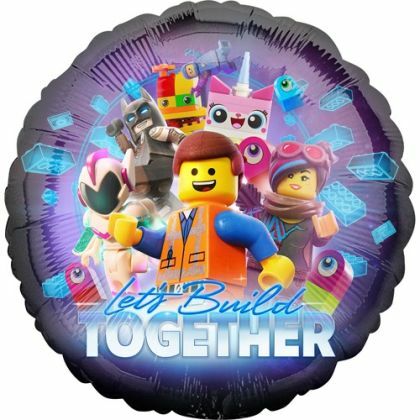 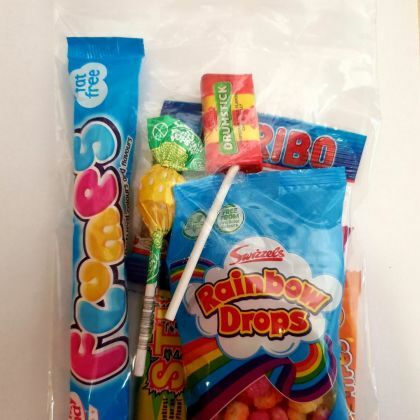 Each party bag comes with a mini bag of Haribo and then select how many toys you would like added as well - toys will be supplied at random and may not necessarily match the theme of the bag. 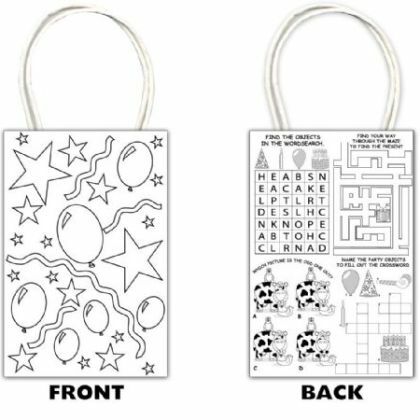 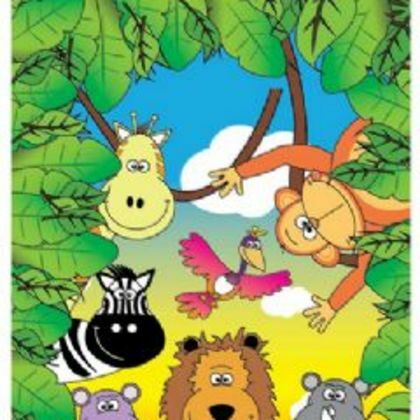 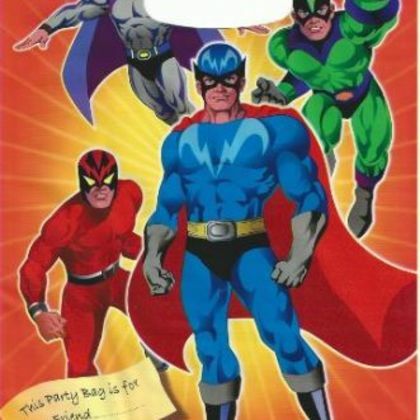 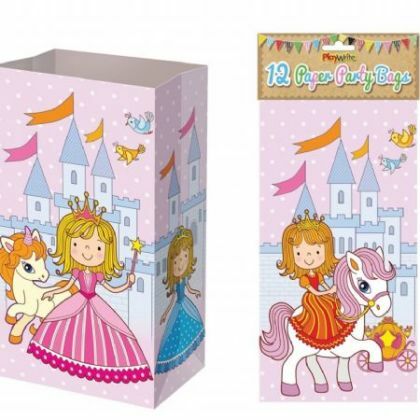 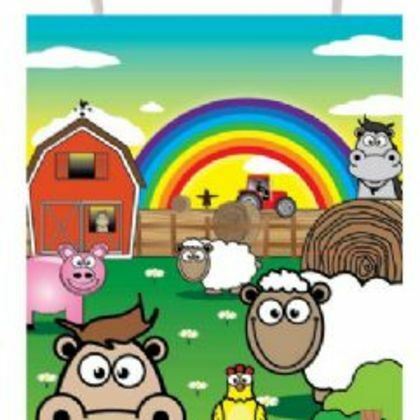 Pre-filled Colouring Paper Party Bags Pre filled paper party bags. 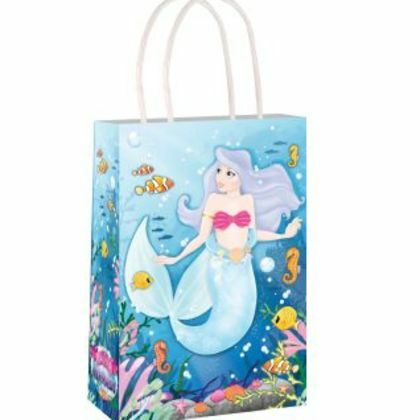 These come in your choice of bag. 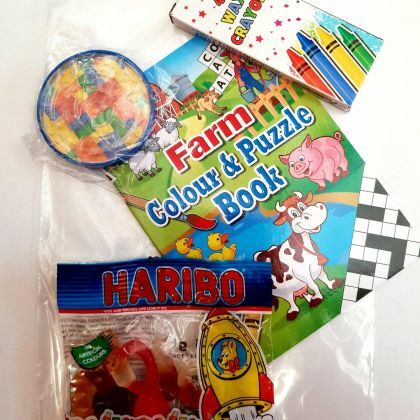 Each party bag comes with a mini bag of Haribo, colouring/puzzle book, crayons and then select how many toys you would like added as well - toys will be supplied at random and may not necessarily match the theme of the bag. 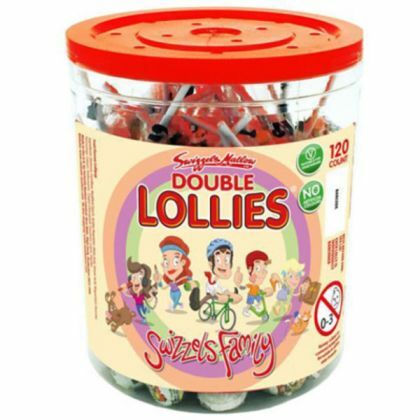 Double Lollies Bulk Tub Contains approx 120 lollies Suitable for vegetarians. 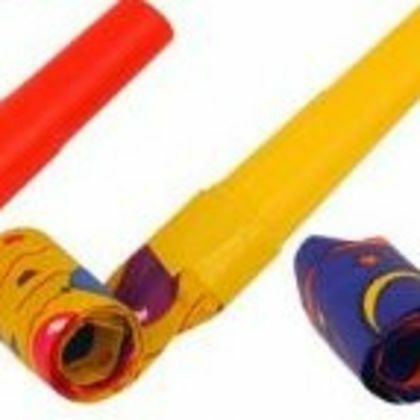 WARNING: NOT SUITABLE FOR CHILDREN UNDER 3 YEARS. 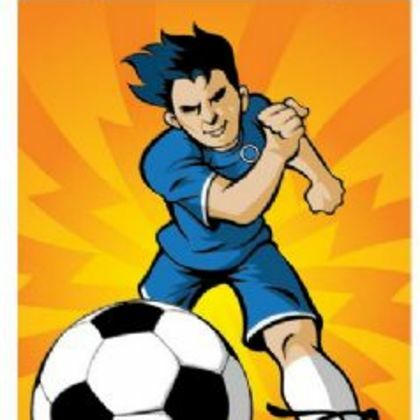 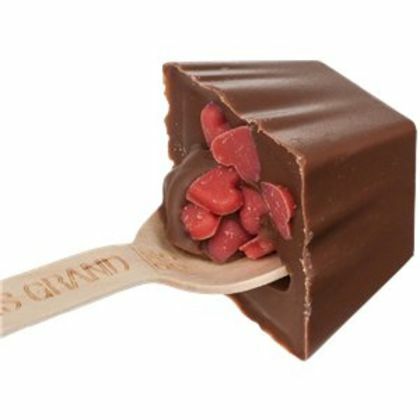 LOLLIPOPS ARE A POTENTIAL CHOKING HAZARD. 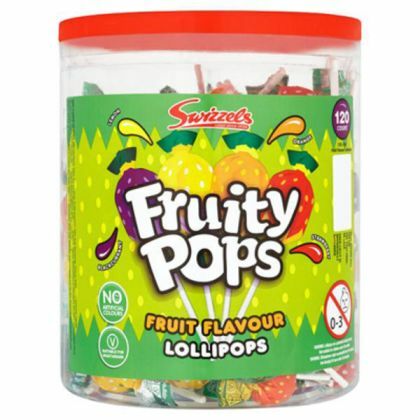 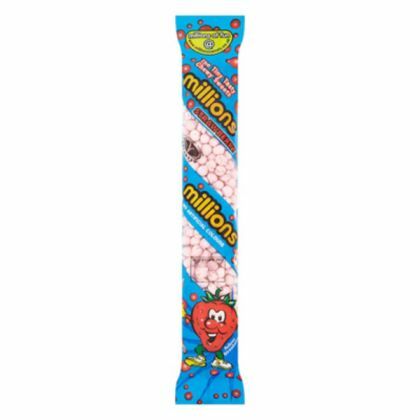 Fruity Pops Bulk Tub - Contains approx 120 lollies Suitable for vegetarians. WARNING: NOT SUITABLE FOR CHILDREN UNDER 3 YEARS. 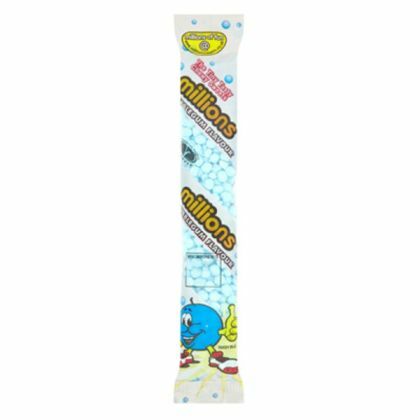 LOLLIPOPS ARE A POTENTIAL CHOKING HAZARD. 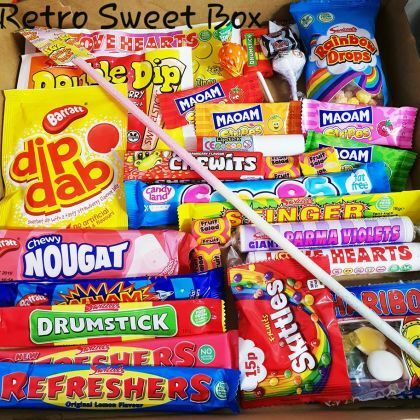 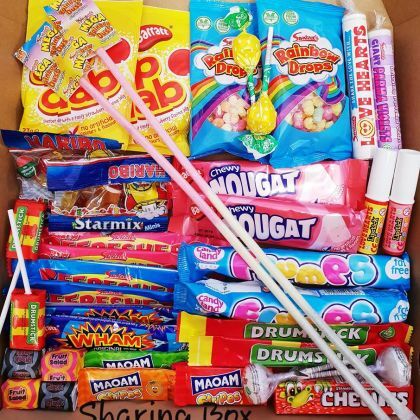 Swizzels Love heart Lipsticks Bulk Box Contains 60 sweets Suitable for vegetarians. 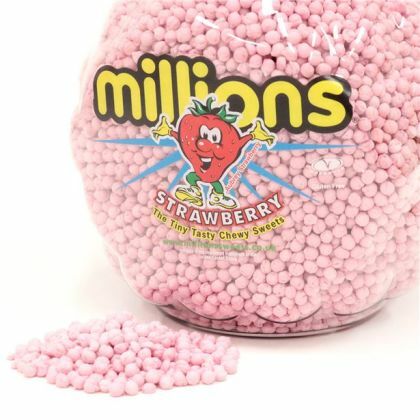 WARNING: NOT SUITABLE FOR CHILDREN UNDER 3 YEARS. 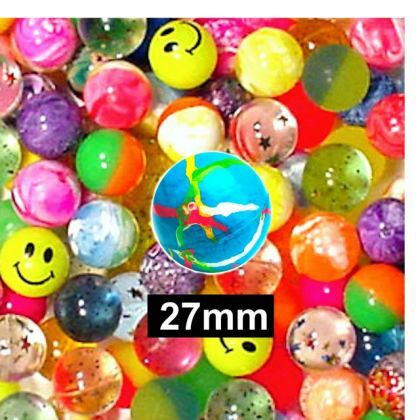 SMALL PARTS - CHOKING HAZARD. 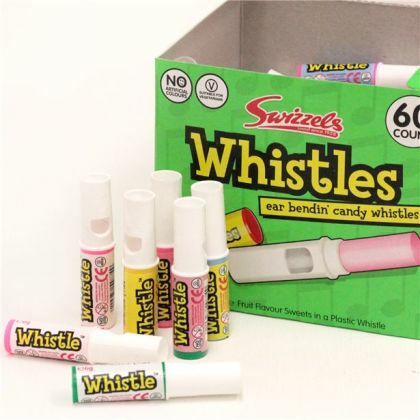 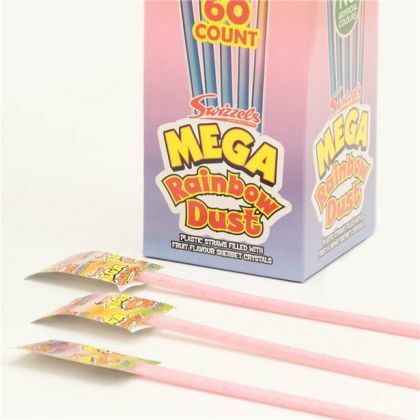 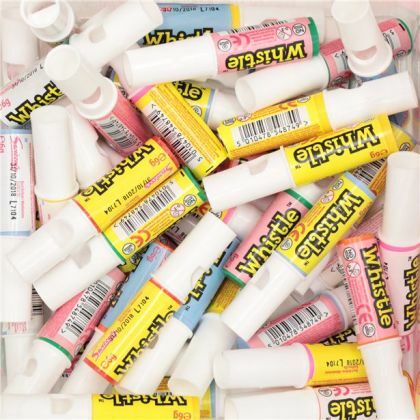 Swizzels Candy Whistles Bulk Box Contains 60 sweets Suitable for vegetarians. 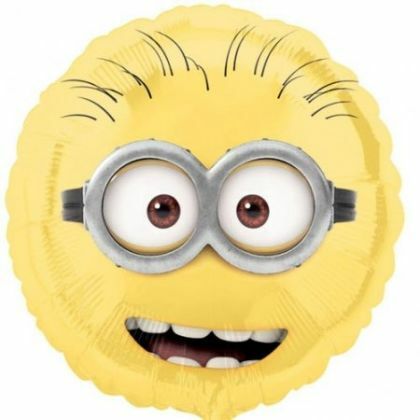 WARNING: NOT SUITABLE FOR CHILDREN UNDER 3 YEARS. 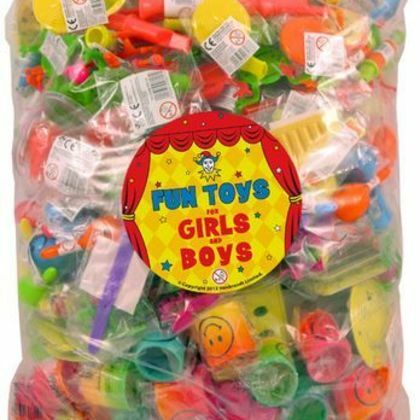 SMALL PARTS - CHOKING HAZARD. 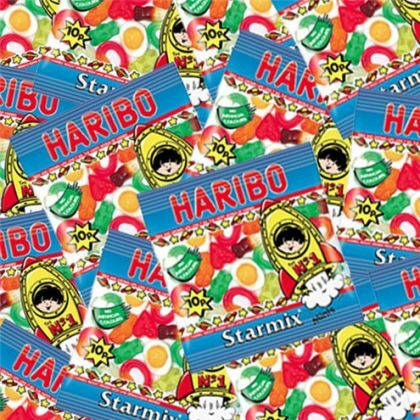 Haribo Mini Star Mix Mini Bags Bulk BoxEach box contains 100 individual mini bags of Haribo Starmix. 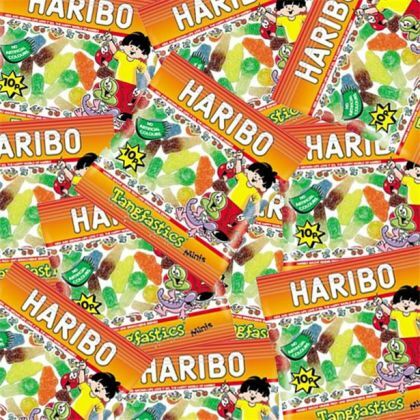 Haribo Tangfastics Mini Bags Bulk BoxEach box contains 100 individual mini bags of Fruit flavoured gummies with a tang. 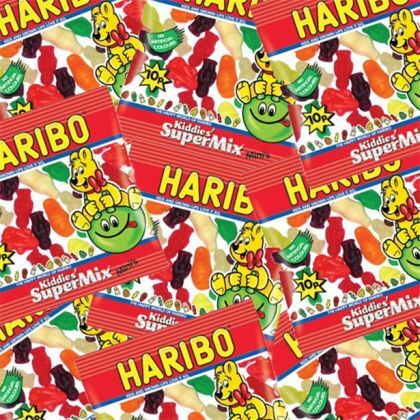 Haribo Kiddies' SuperMix Mini Bags Bulk BoxEach box contains 100 individual mini bags of Fruit flavoured gummies. 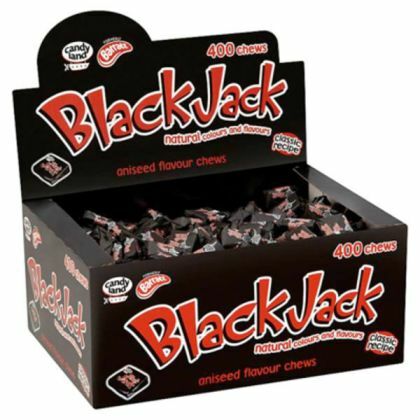 Black jack chews bulk box A bulk box of approximately 400 wrapped black jack chews - A retro favourite! 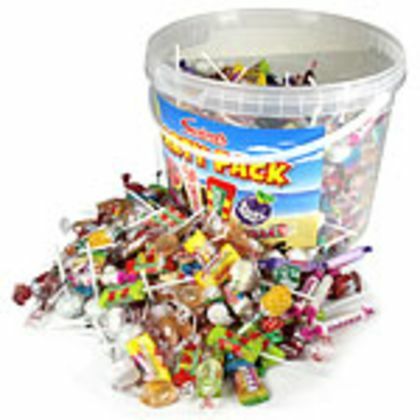 Ideal in party bags or as part of a pick and mix stand. 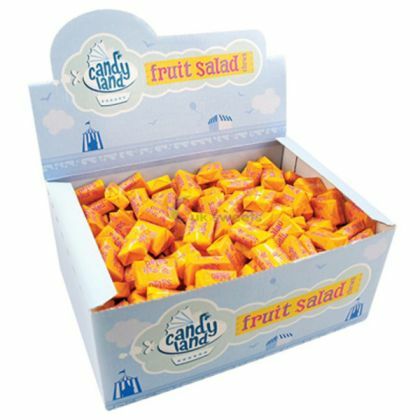 Fruit Salad chews bulk box A bulk box of approximately 400 wrapped fruit salad chews - A retro favourite! 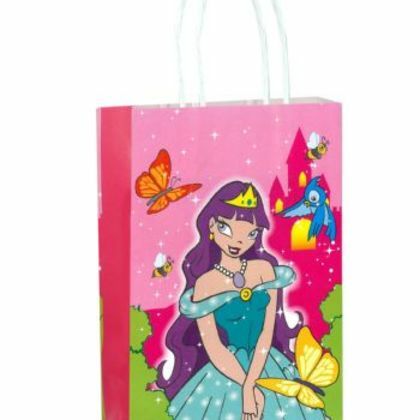 Ideal in party bags or as part of a pick and mix stand. 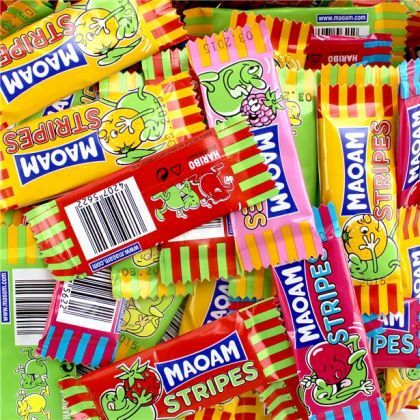 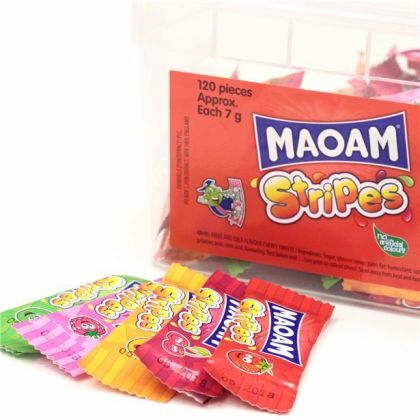 Maoam Stripes bulk tub A bulk tub of Maoam stripes sweets containing 120 chews in various flavours. 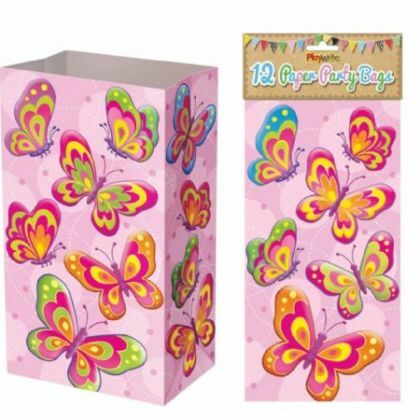 Great for party bags or as part of a pick and mix stand. 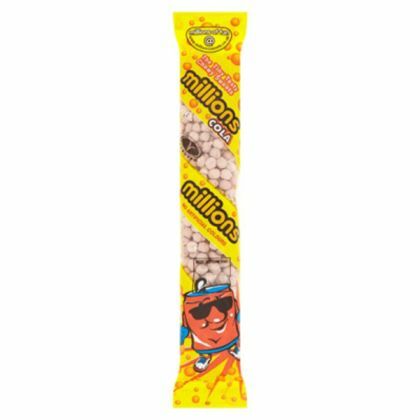 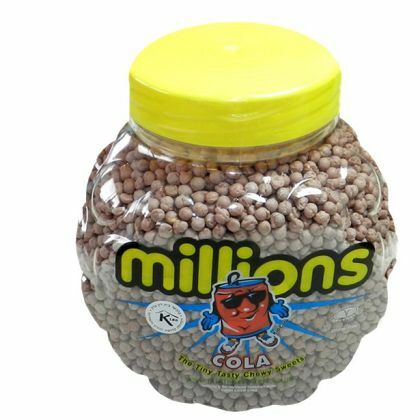 Bubblegum Millions Jar 2.27kg Jar Gluten Free. 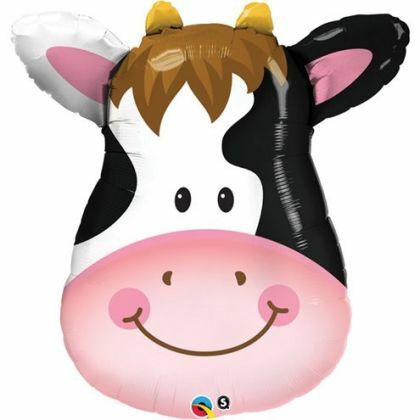 Vegetarian Society Approved. 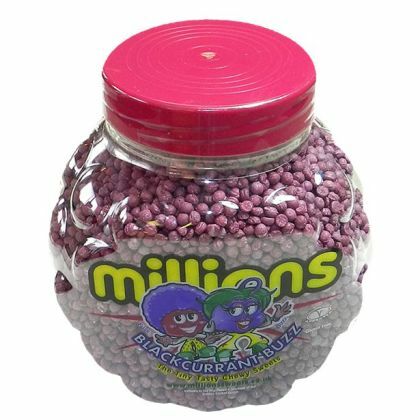 Blackcurrant Millions 2.27kg Jar Gluten free. 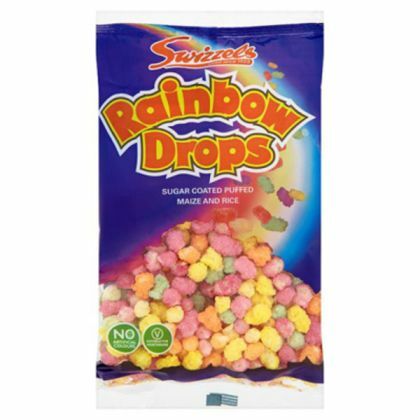 Vegetarian Society Approved. 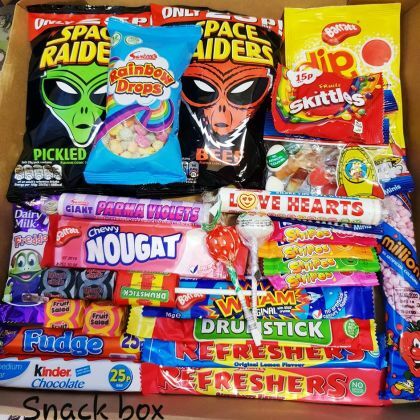 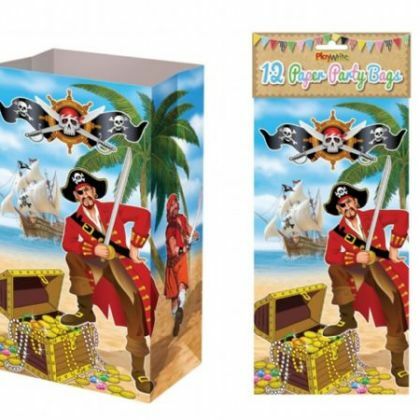 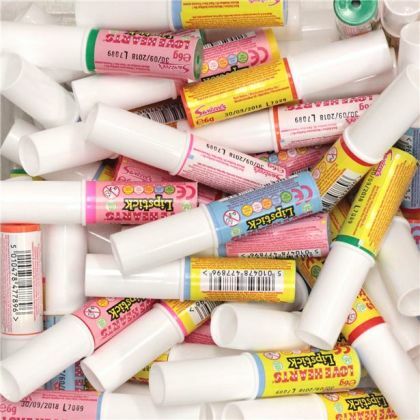 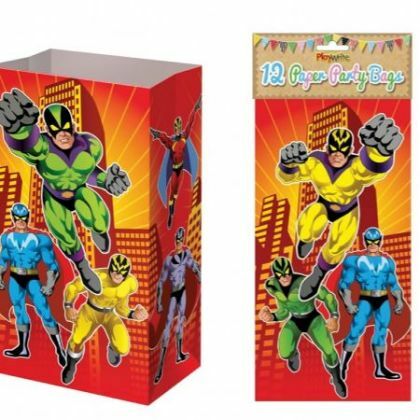 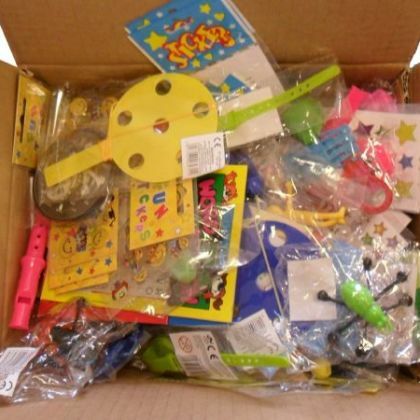 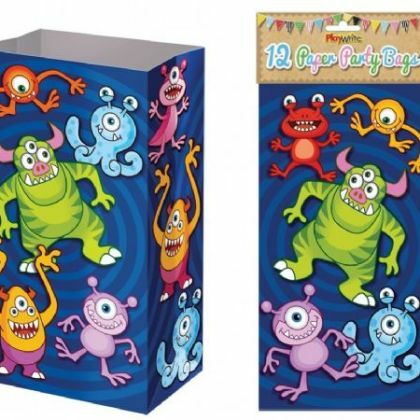 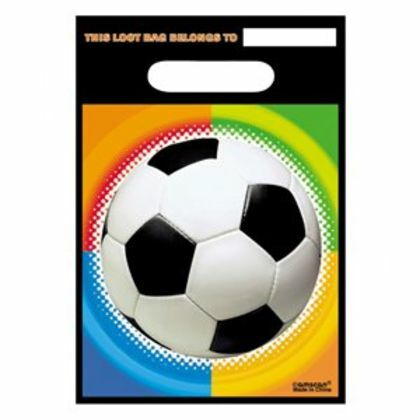 Box of 100 Assorted Party Bag Fillers supplied at random. 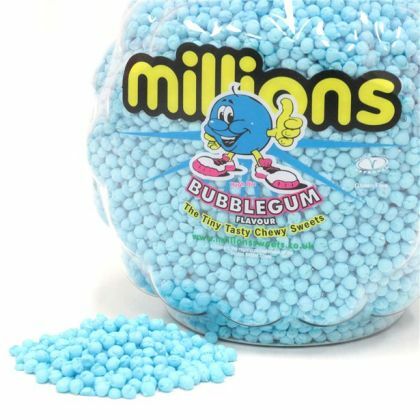 Ideal for lucky dips. 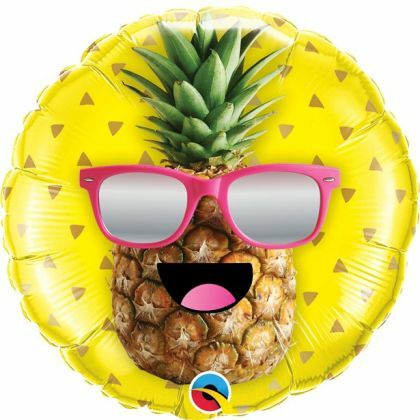 Items may differ slightly from image shown. 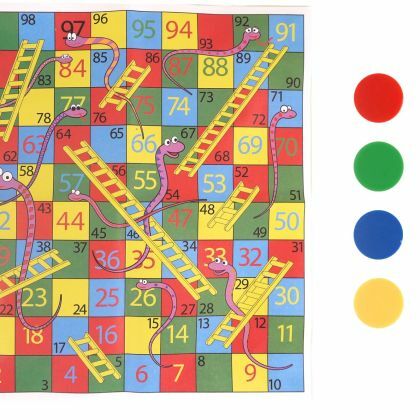 Snakes and Ladders The favourite board game in a handy size for travel. 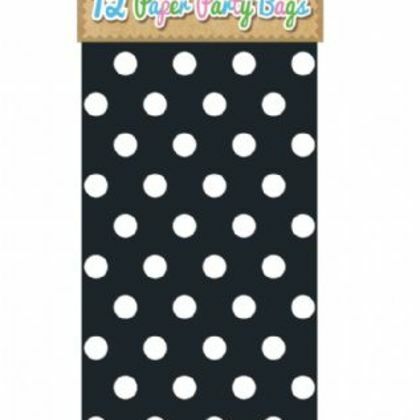 The board is 8 X 6.5cm and comes with dice and counters. 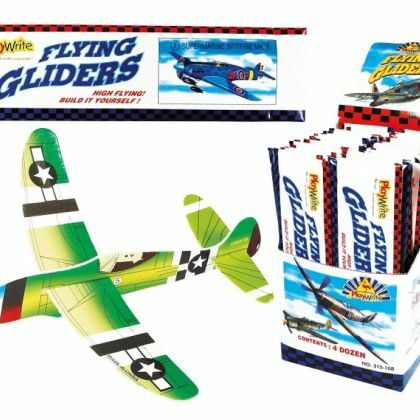 Polystyrene glider approx 15cm wingspan. 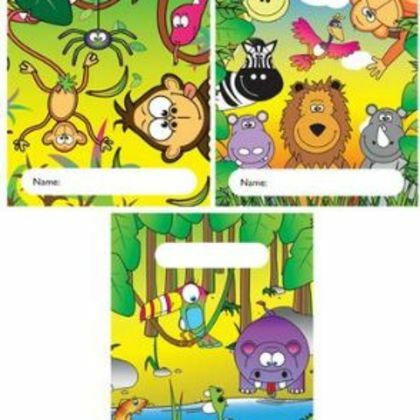 12 asstd designs - supplied at random, each in paper 21.5 x 6cm envelope. 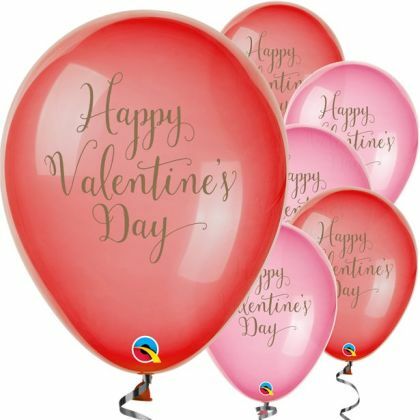 Metallic Red Heart Balloon - 18" Foil • Celebrate with fun balloons• Foil balloon – supplied uninflated• Measures 18 inches• Suitable for helium inflation onlyWhether you’re celebrating a wedding, anniversary or Valentine’s Day, this classic red heart-shaped balloon is ideal. 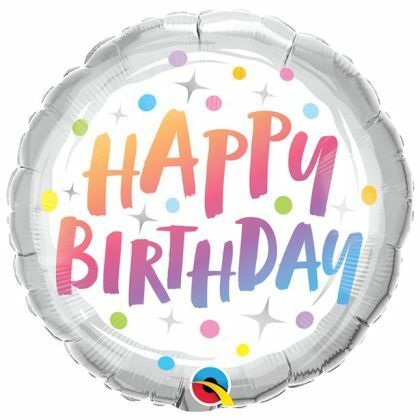 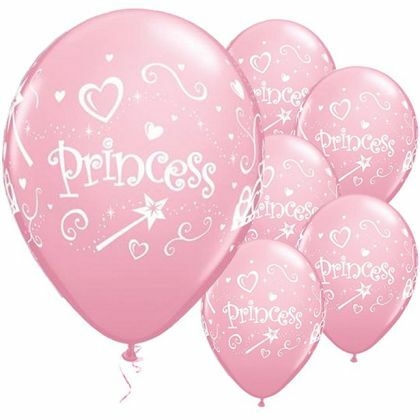 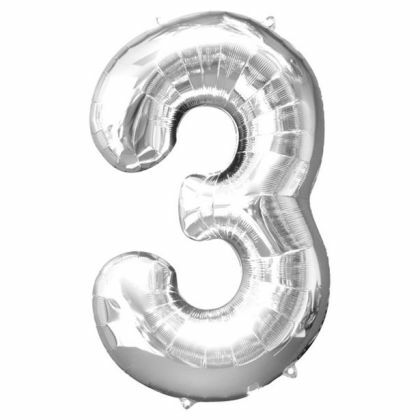 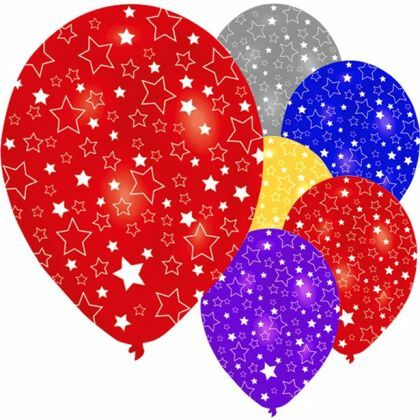 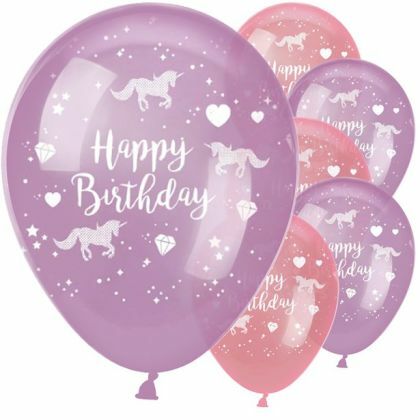 With a shiny metallic finish, it looks great on its own or used as part of a romantic balloon bouquet.Please see our range of disposable helium canisters. 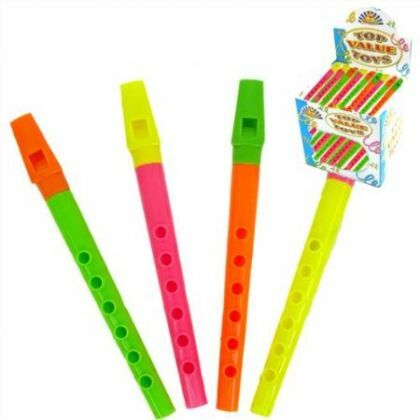 Flute whistles Brightly coloured flutes. 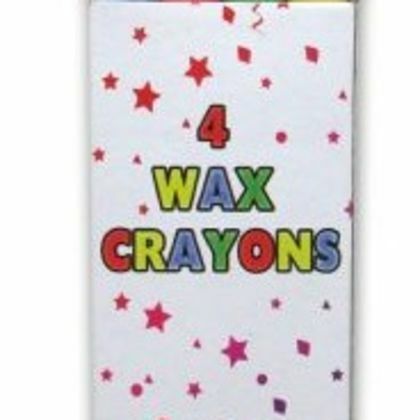 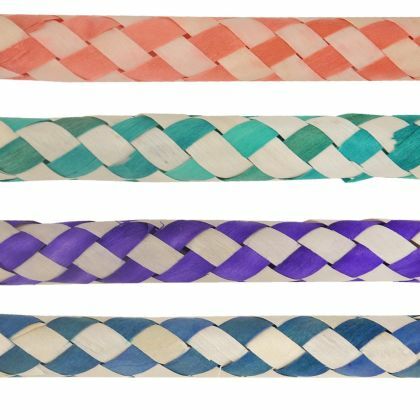 4 Assorted colours. 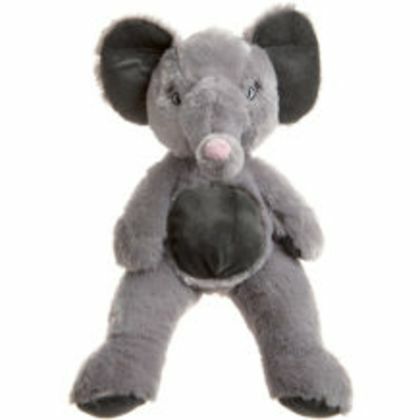 Size approx 16.5cm. 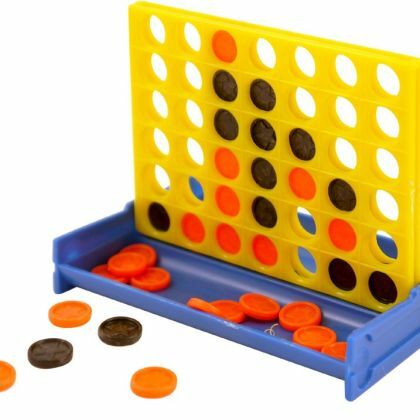 4 in a row game In line game. 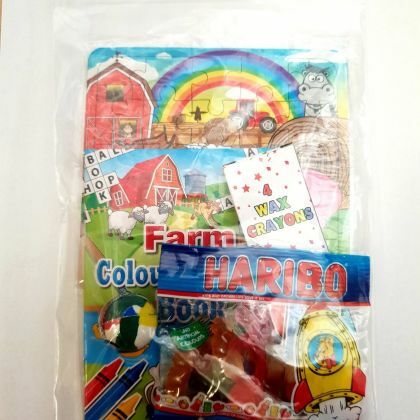 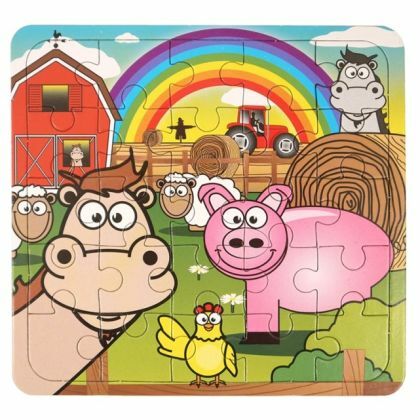 Each in poly bag with 40 pieces. 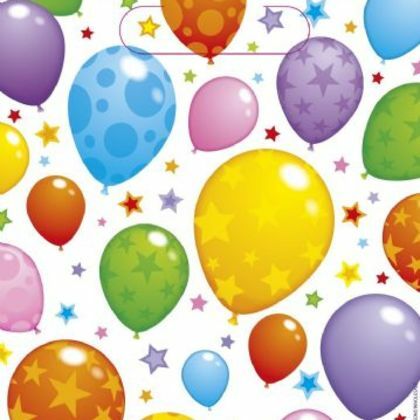 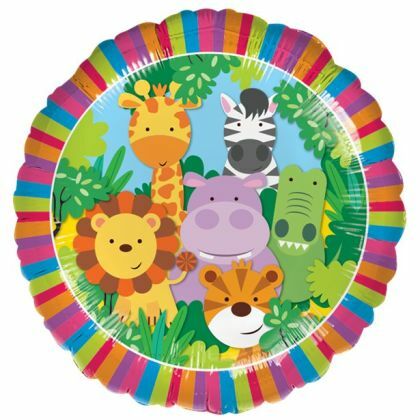 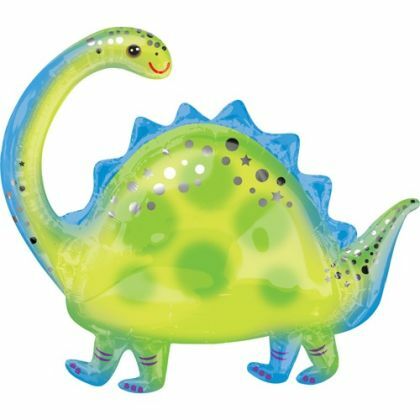 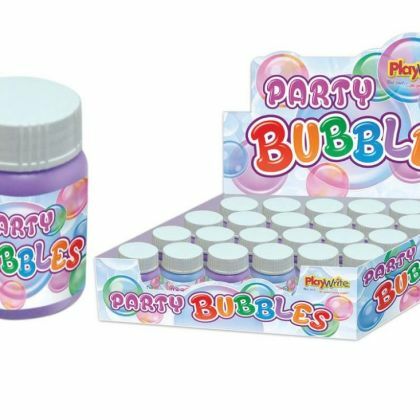 Bubbles - 25ml These 5 cm tubs are ideal for party bags, party favours and party fun. 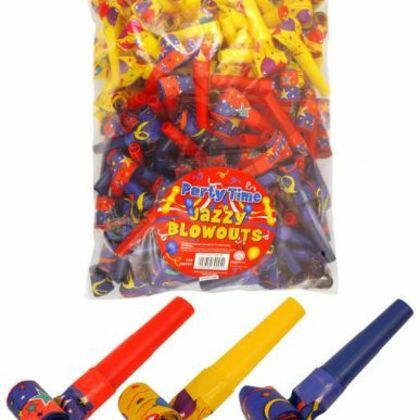 Bag of 144 Jazzy Blowouts 3 Assorted colours. 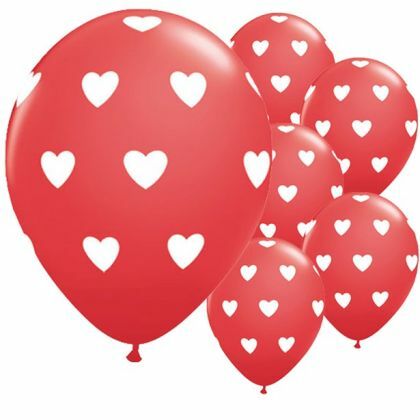 Big Red Hearts Balloons - 11" Latex• Celebrate with fun balloons• 6 latex balloons (supplied uninflated)• Each measures 11 inches• Suitable for helium or air inflationThese pretty balloons feature cute white love hearts printed on a red background. 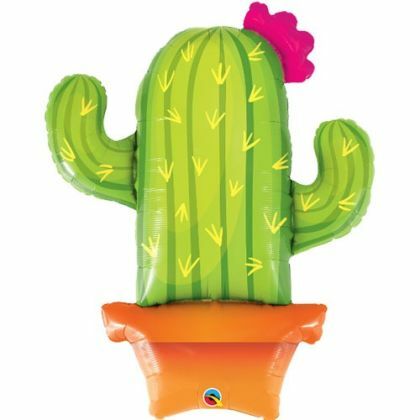 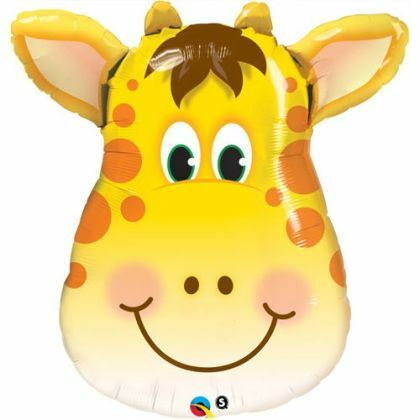 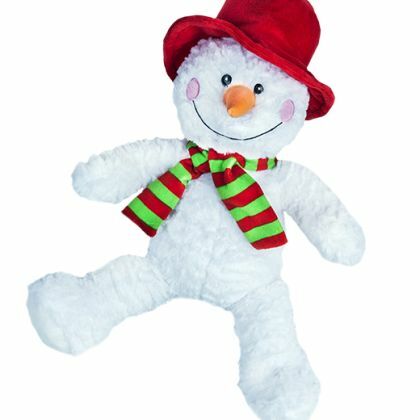 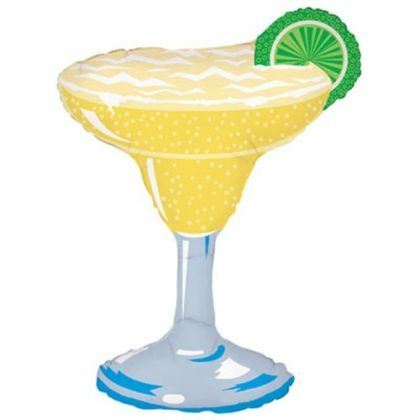 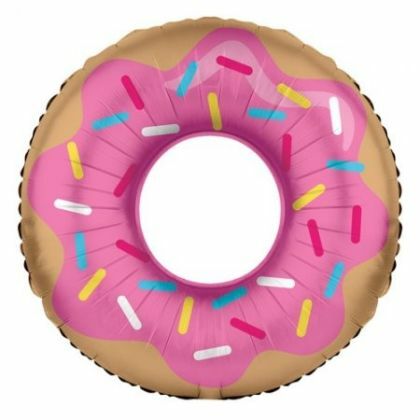 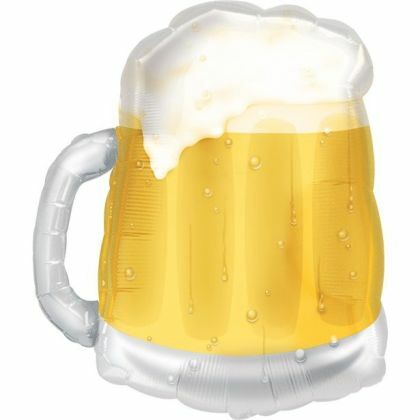 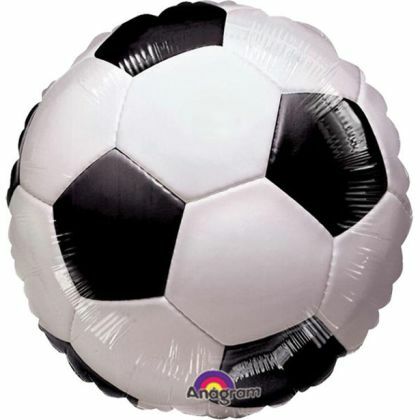 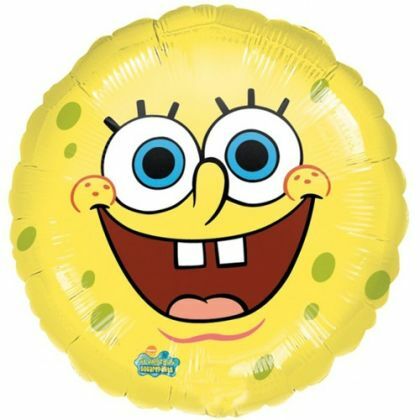 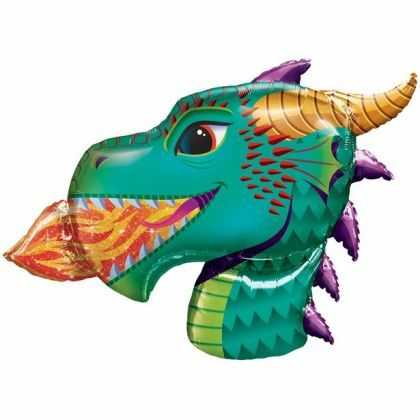 Whether filled with air or helium, they make a great decoration for wedding receptions, anniversaries or Valentine’s Day. 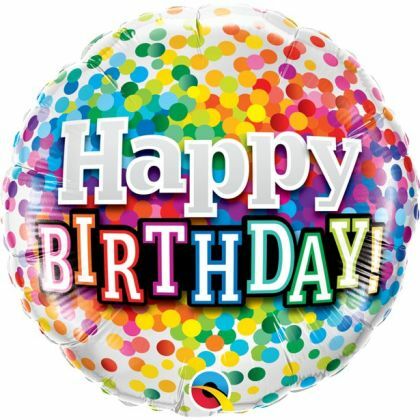 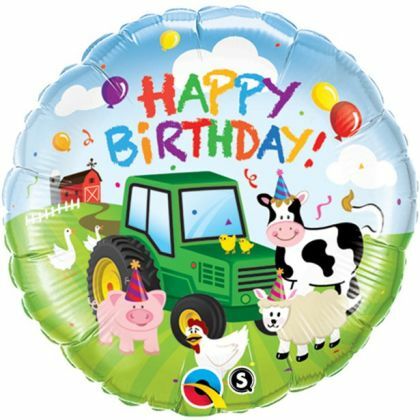 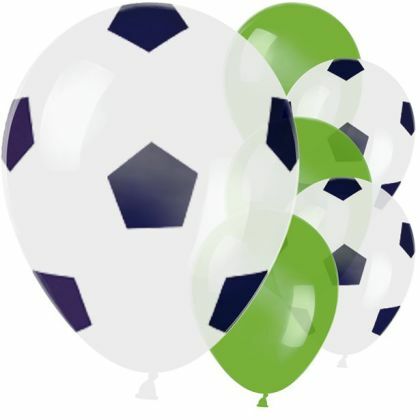 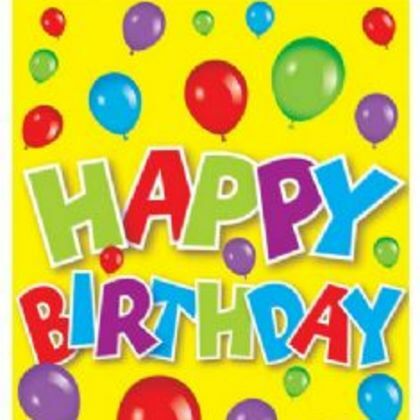 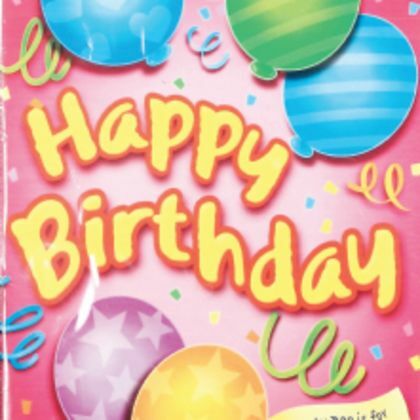 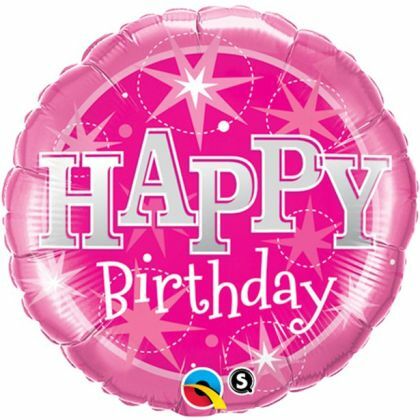 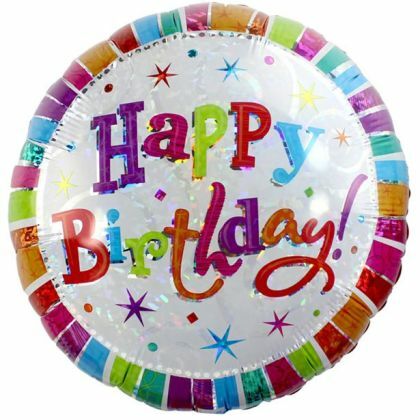 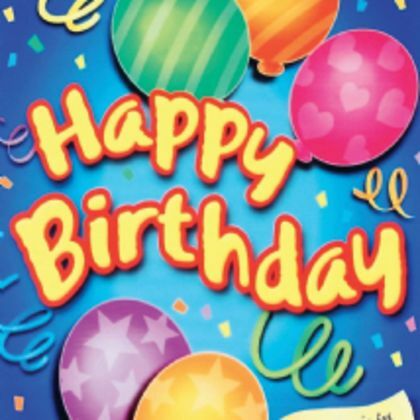 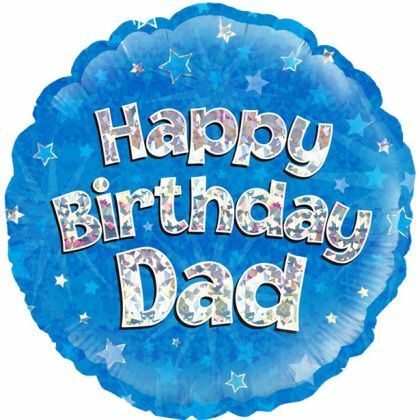 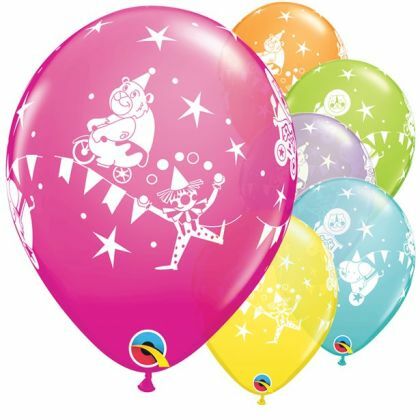 Please see our range of disposable helium canisters. 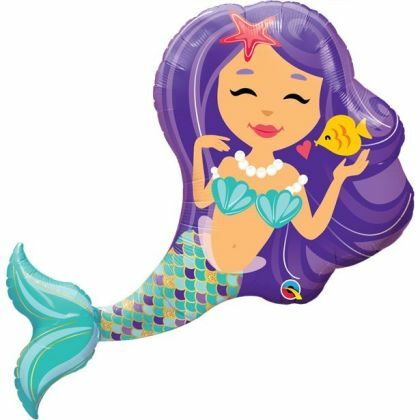 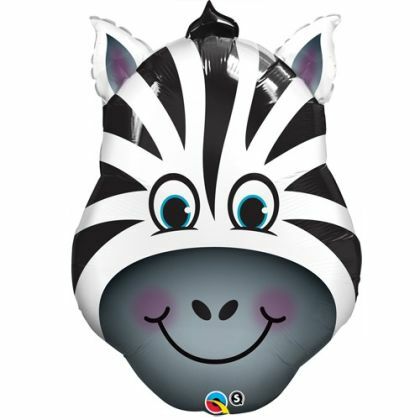 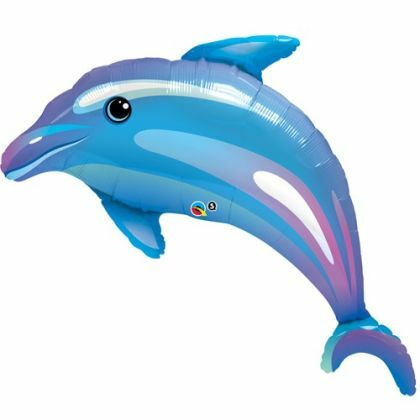 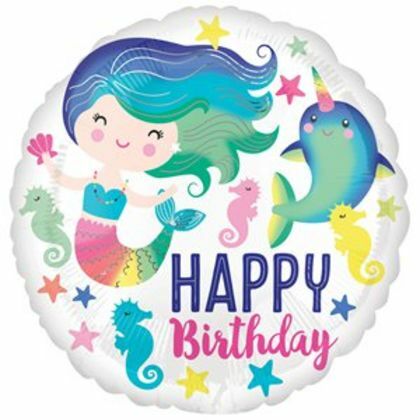 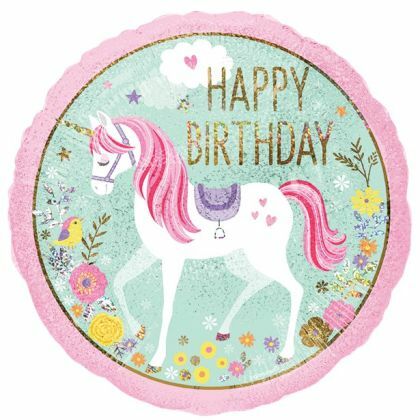 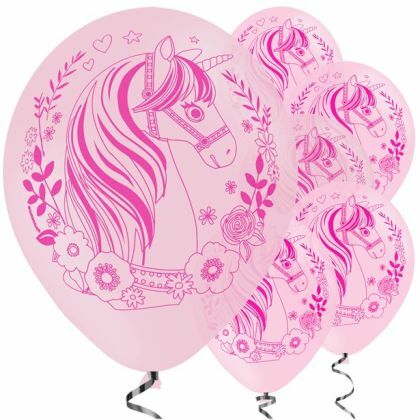 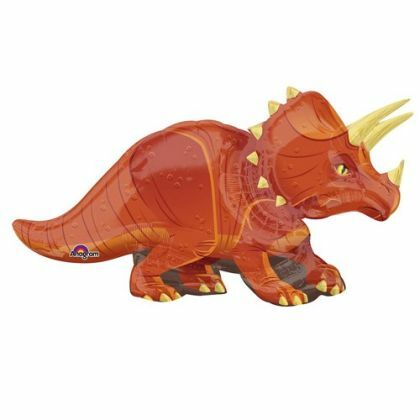 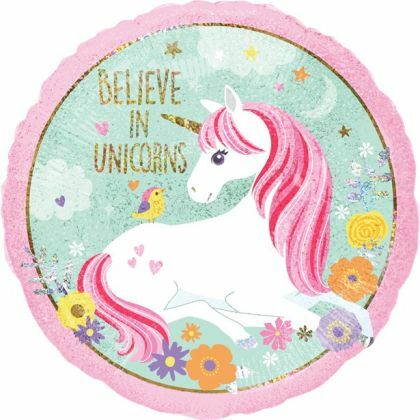 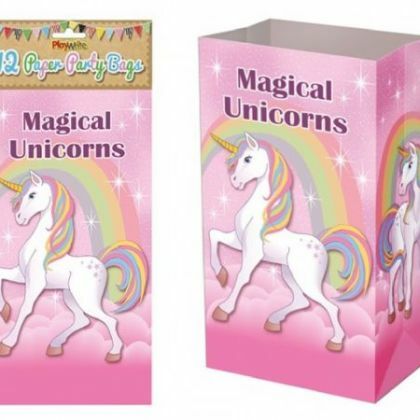 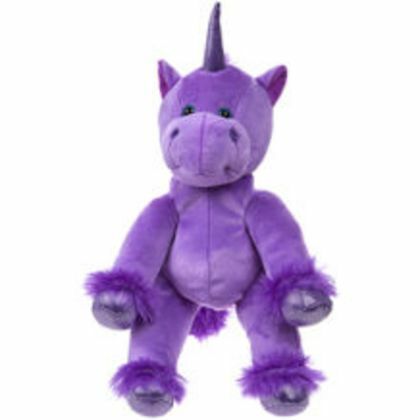 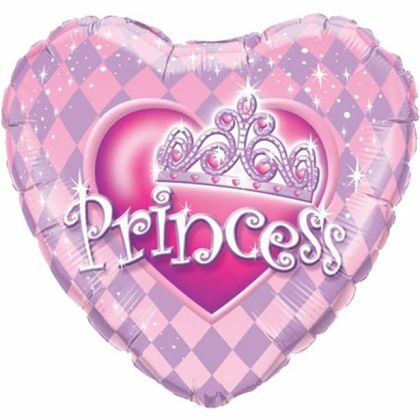 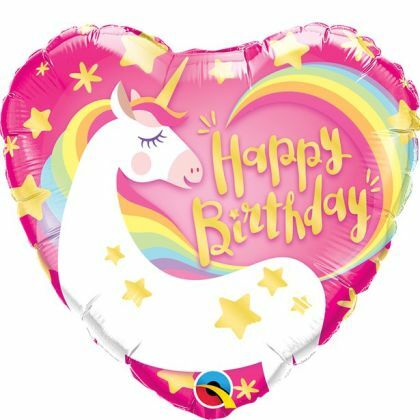 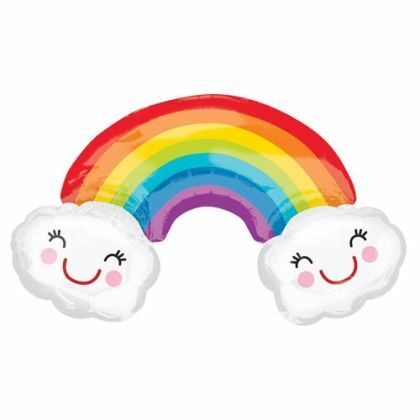 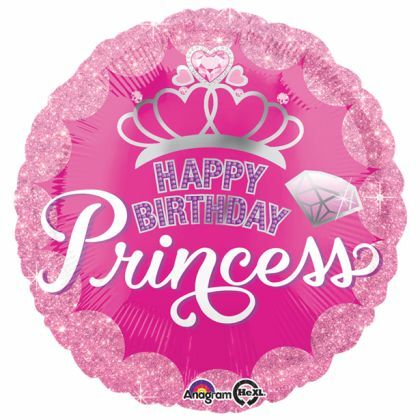 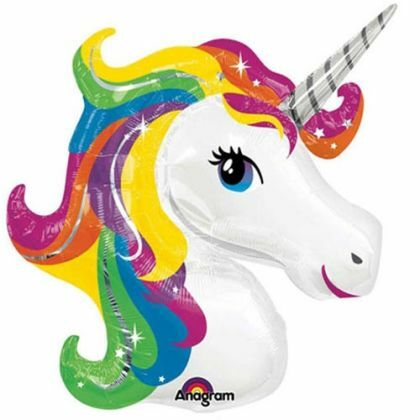 Unicorn Love Foil Balloon - 21"• Celebrate Valentine’s Day• Foil balloon – supplied uninflated• Measures 21 inches• Suitable for helium inflation onlyShow your love for someone special this Valentine’s Day with a cute unicorn shaped balloon.Please see our range of disposable helium canisters. 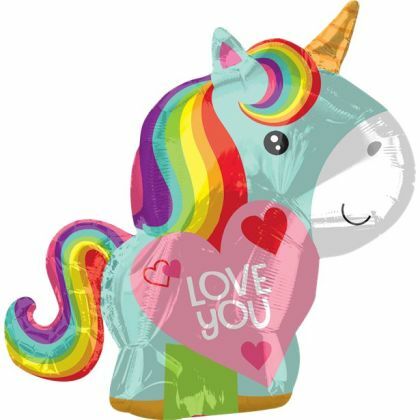 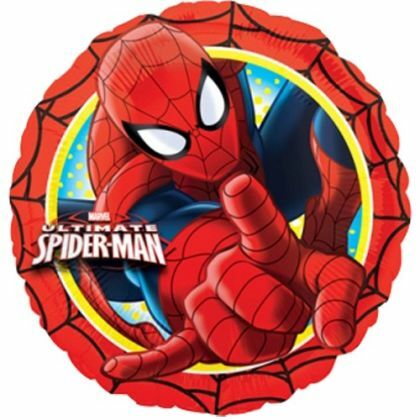 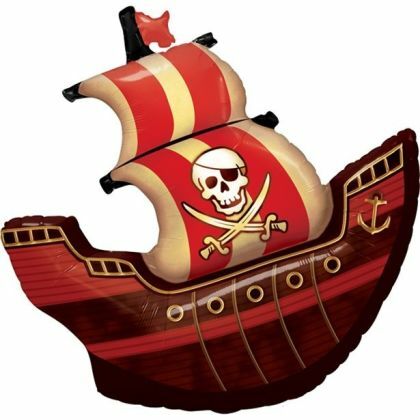 Emoticons in Love Supershape - 36" Foil• Celebrate Valentine’s Day• Foil balloon – supplied uninflated• Measures 36” w x 21” h• Suitable for helium inflation onlySpread the love this Valentine’s Day with this adorable supershape balloon. 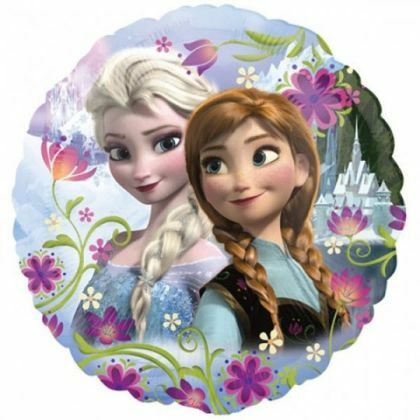 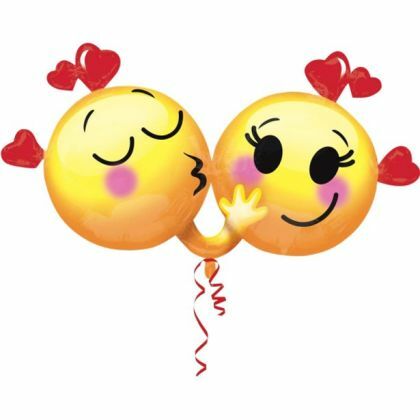 It features 2 cute emoticons – one kissing the other on the cheek! 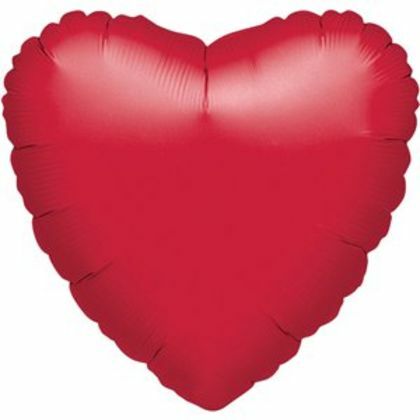 Surrounded by red hearts, it’s a great centrepiece for a Valentine’s Day balloon bouquet. 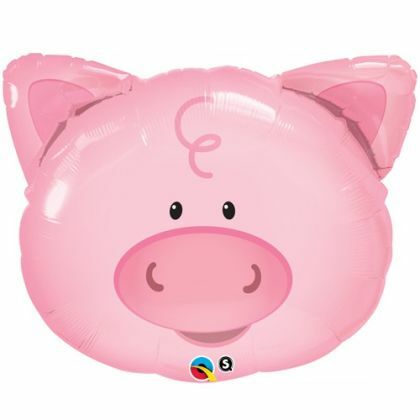 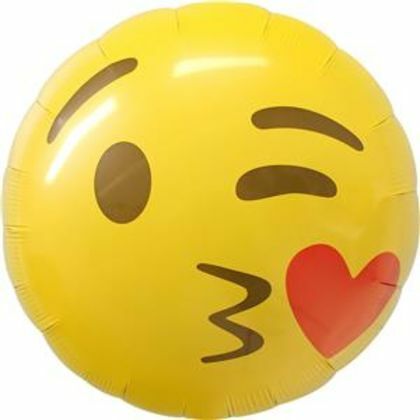 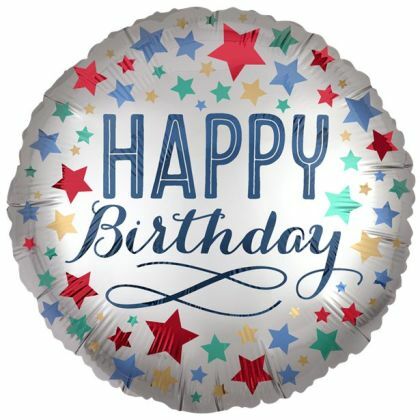 Emoji Heart Eyes Balloon - 18" Foil• Celebrate with an Emoji theme• Foil balloon – supplied uninflated• Measures 18 inches• Suitable for helium inflation onlySend this cute balloon to someone special to let them know how they make you feel! 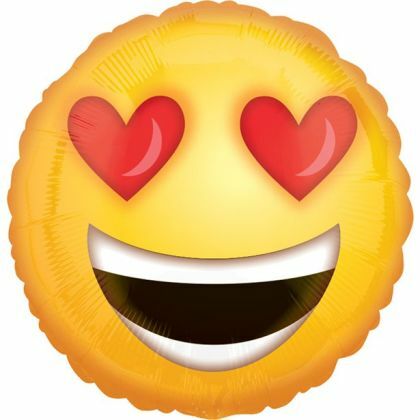 Just like the popular emoji, the grinning face has heart eyes – perfect for Valentine’s Day. 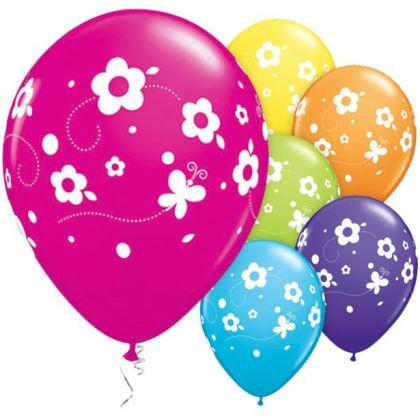 Please see our range of disposable helium canisters. 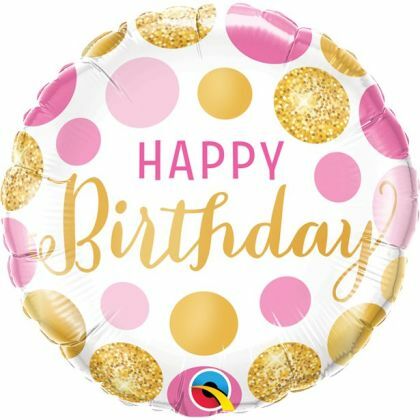 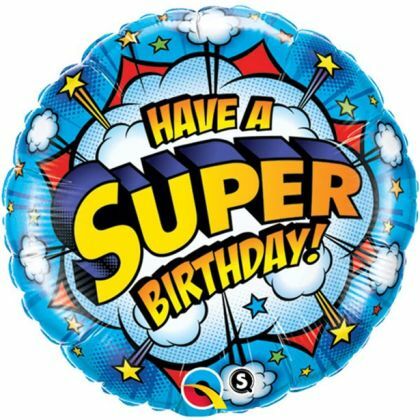 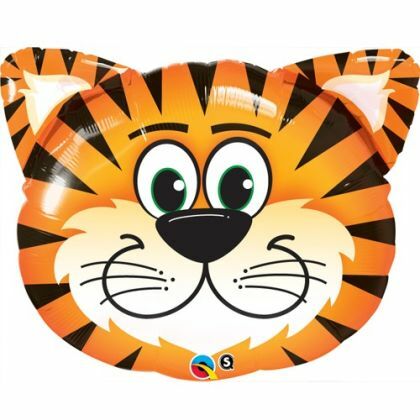 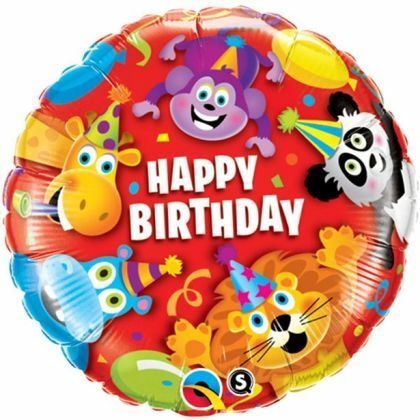 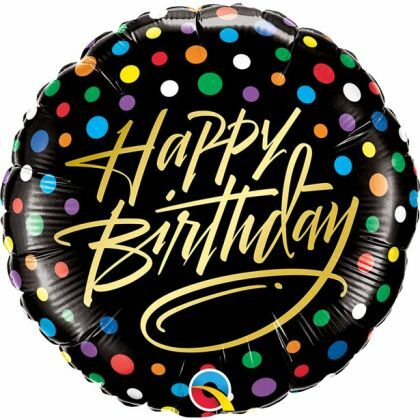 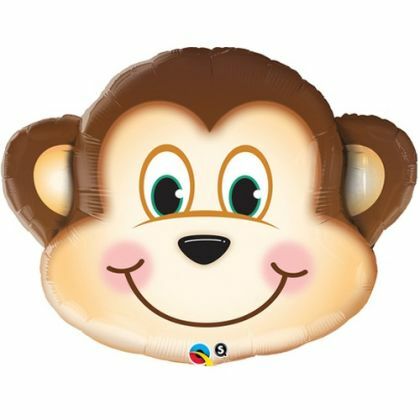 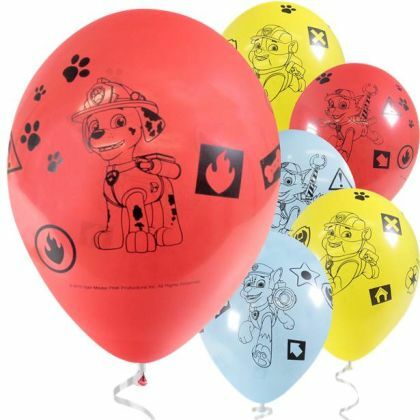 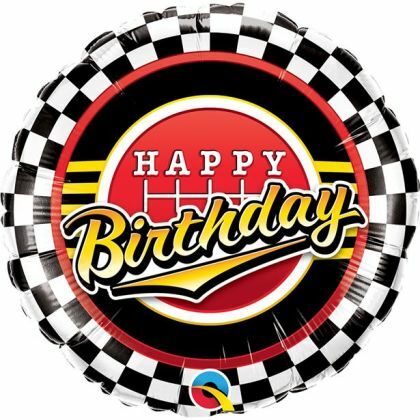 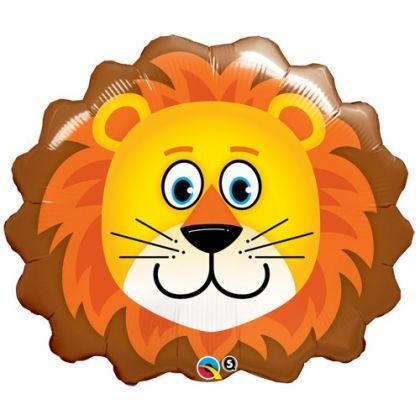 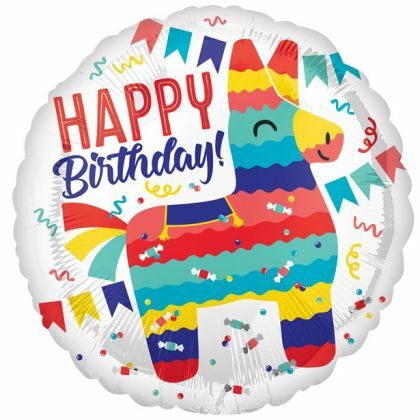 Cat Love Emoticon SuperShape - 22" Foil• Celebrate with fun balloons• Foil balloon – supplied uninflated• Measures 22 inches• Suitable for helium inflation onlyPick this cute balloon for someone special – it’s great for Valentine’s Day. 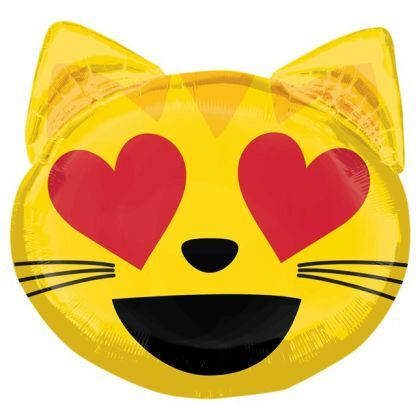 Shaped like the popular emoji, the yellow cat face has heart eyes for the one you love. 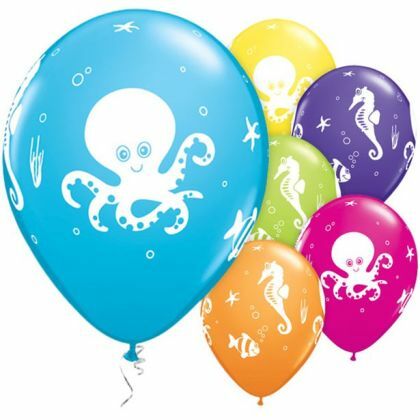 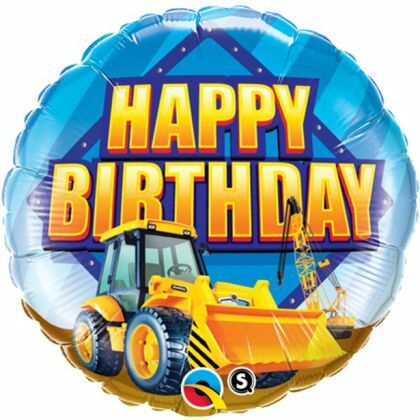 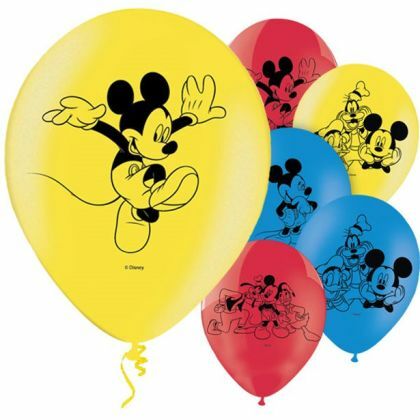 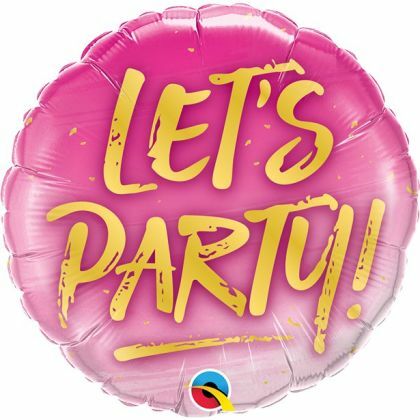 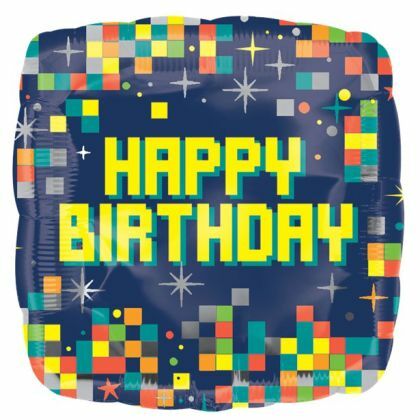 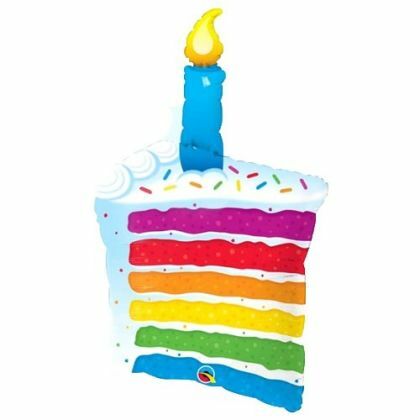 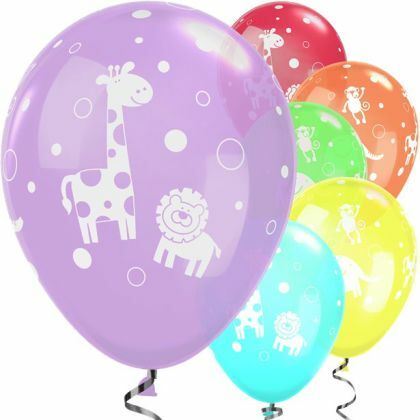 It’s the perfect decoration for an emoji themed party.Please see our range of disposable helium canisters. 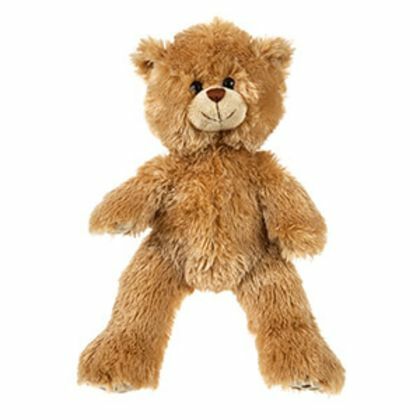 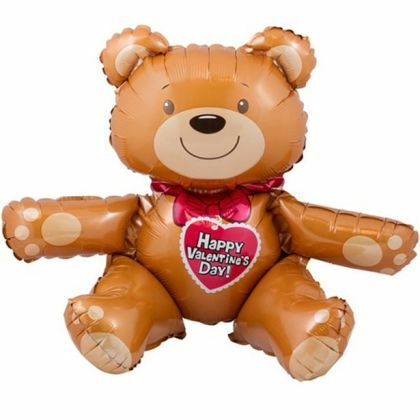 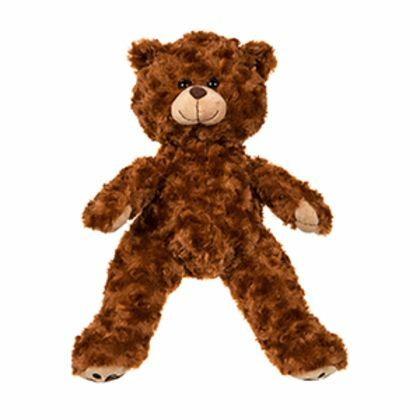 Valentines Sitting Bear Balloon - 19'' Foil• Celebrate Valentine’s Day• Cute teddy bear sitting balloon• Measures 19 inches• Suitable for air inflation onlyFill this teddy bear shaped balloon with air and it’ll sit perfectly on a flat surface. 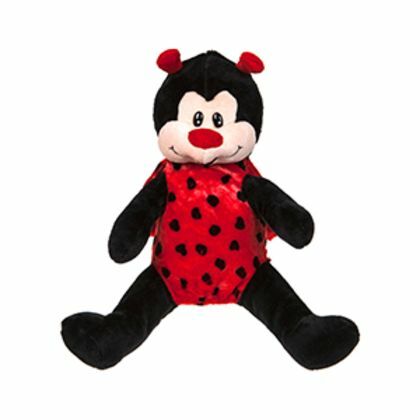 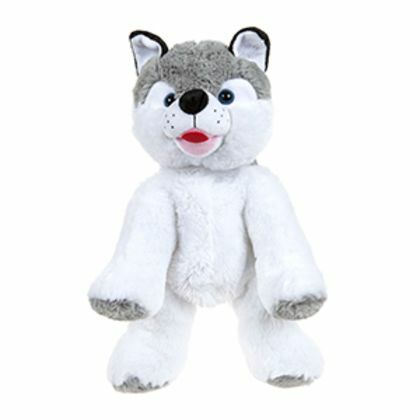 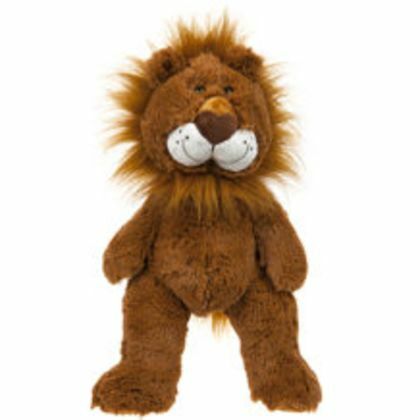 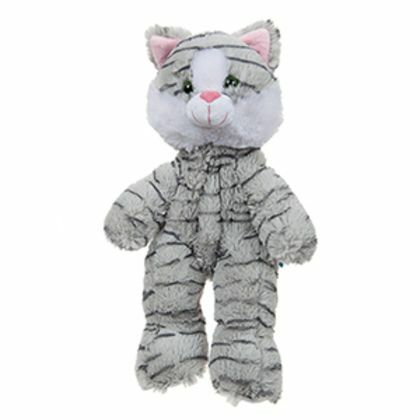 With a red heart on its chest that says ‘Happy Valentine’s Day’, it makes a great gift for someone special. 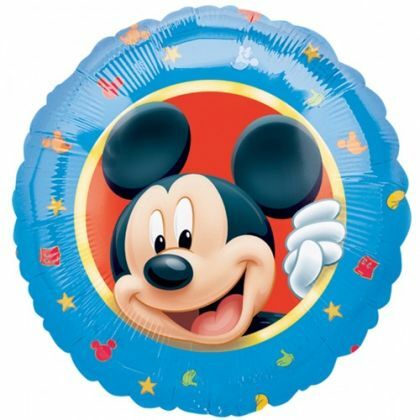 Or sit him in the middle of your table for a Valentine’s Day party centrepiece. 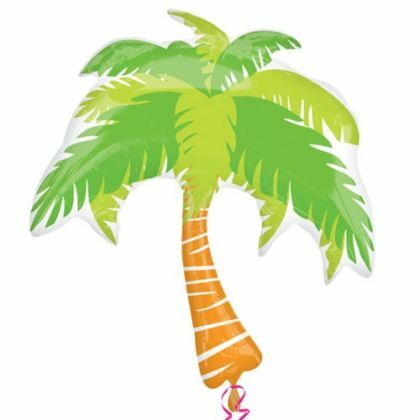 Rose Gold Love Foil Balloon - 30"• Celebrate with fun balloons• Spells out ‘Love’• Measures 75cm• Suitable for air inflation onlyAdd a little romance to your celebrations with this beautiful foil balloon. 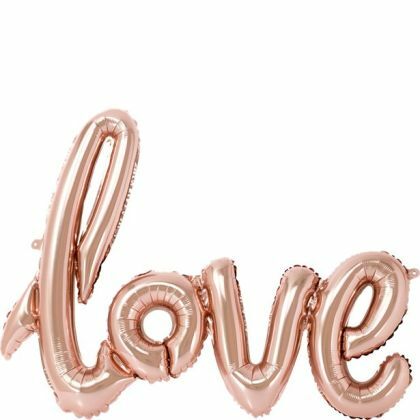 Designed to be inflated with air, this rose gold balloon spells out the word ‘Love’ in pretty, swirly writing. 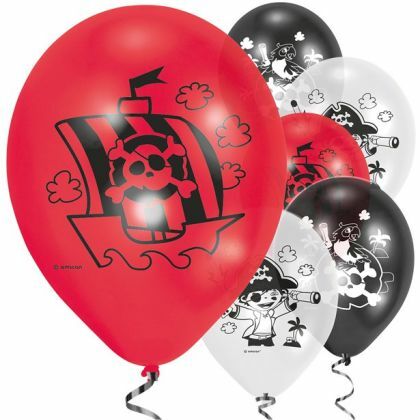 It’s the perfect decoration for a wedding reception, anniversary party or Valentine’s Day. 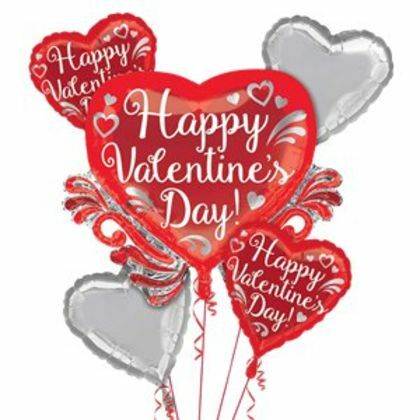 Happy Valentine's Day Balloon - 18" Foil• Celebrate Valentine’s Day• Foil balloon – supplied uninflated• Measures 18 inches• Suitable for helium inflation onlyPerfect for Valentine’s Day parties, or sending to your Valentine, this pretty heart-shaped balloon is a great way to celebrate love. 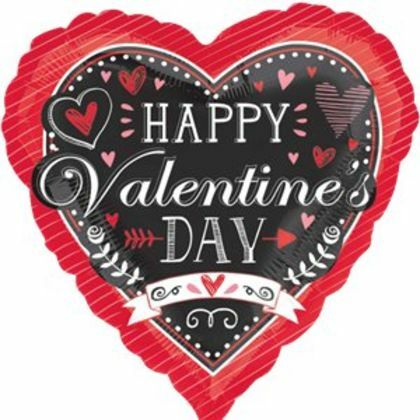 Designed to look like a chalkboard on a red background, it features the words ‘Happy Valentine’s Day’ surrounded by red and pink love hearts. 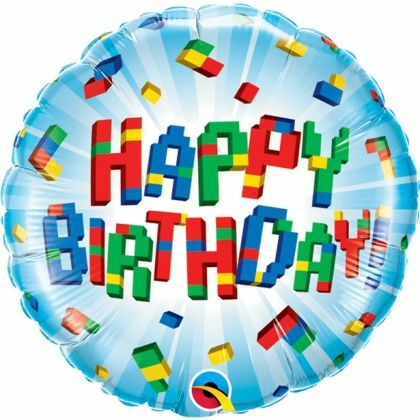 Please see our range of disposable helium canisters. 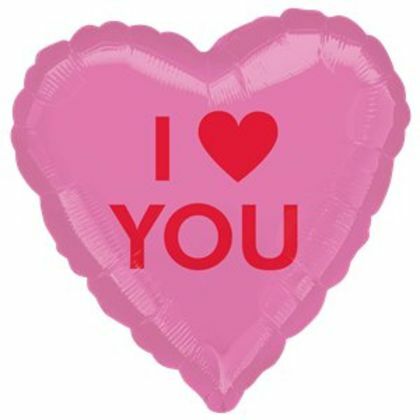 I Heart You Candy Heart Balloon - 18" Foil• Celebrate Valentine’s Day• Foil balloon – supplied uninflated• Measures 18 inches• Suitable for helium inflation onlyDeclare your love with this striking pink and red balloon. 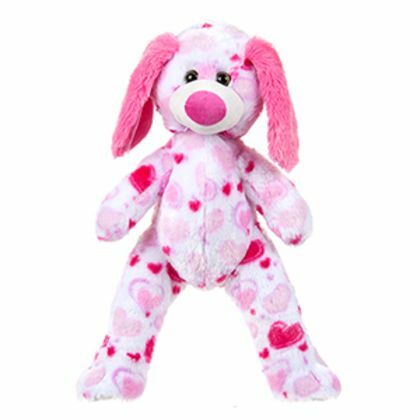 Whether it’s your anniversary, Valentine’s Day or just a sweet surprise, your other half will love this little gift. Finish it off with a ribbon and balloon weight to stop it floating away. 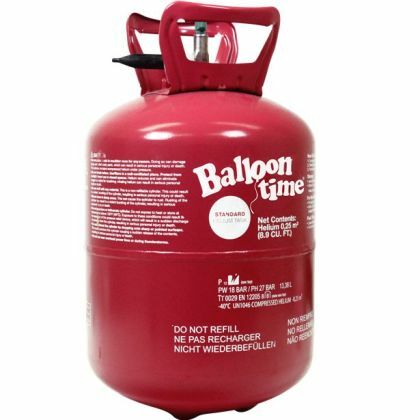 Please see our range of disposable helium canisters. 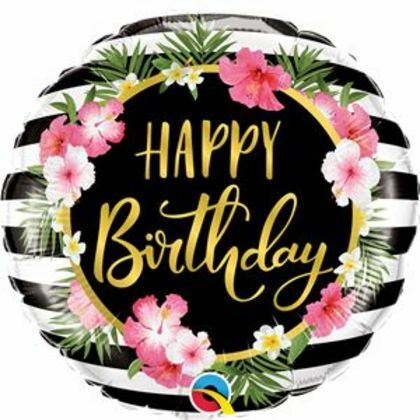 Heart Chalkboard Balloon - 28" Foil• Celebrate with fun balloons• Foil balloon – supplied uninflated• Measures 28 inches• Suitable for helium inflation only• Permanent white marker includedWrite your own message to that special someone on this cool chalkboard style balloon. 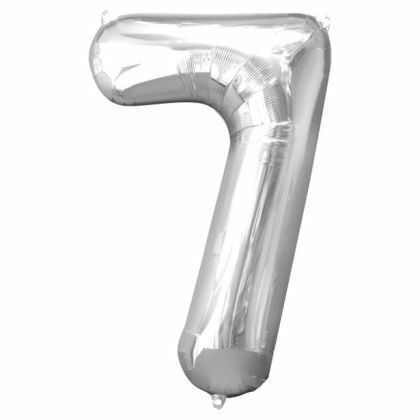 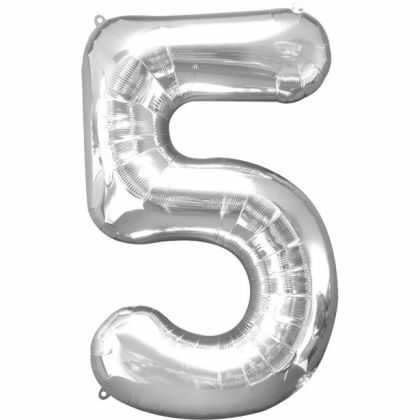 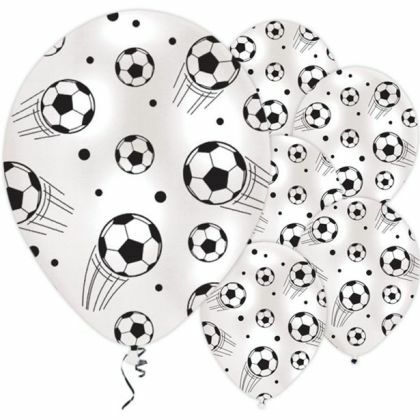 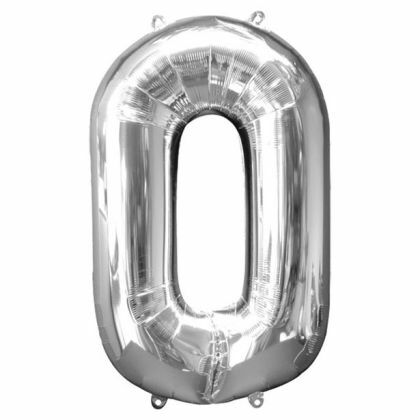 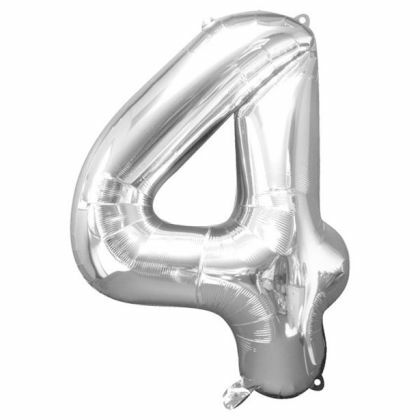 Shaped like a heart with a metallic silver border, this balloon comes with a permanent white marker that lets you add any phrase onto the centre – from ‘Happy Birthday’ to ‘Best wishes on your anniversary’ or maybe even a proposal........Please see our range of disposable helium canisters. 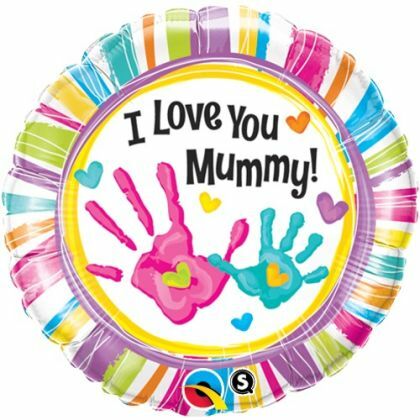 Valentines Balloon Bouquet - Assorted Foil• Celebrate Valentine’s Day• Create a balloon bouquet• 5 assorted foils (supplied uninflated)• Suitable for helium inflation onlyCreate a romantic balloon bouquet with this Valentine’s Day themed kit. 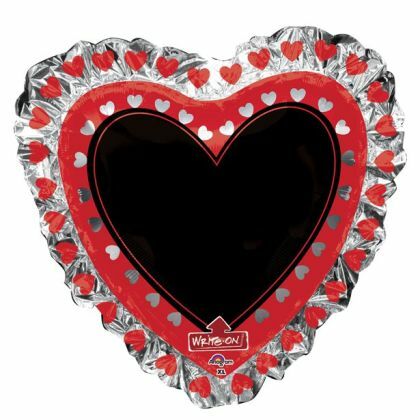 It includes a supershape balloon to use as the centrepiece, along with 2 x 18 inch red ‘Happy Valentine’s Day’ foils and 2 x 18 inch heart shaped silver foils. 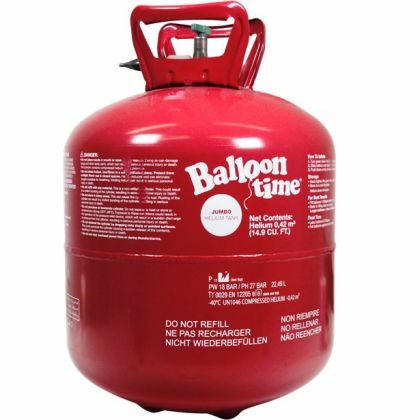 Please see our range of disposable helium canisters. 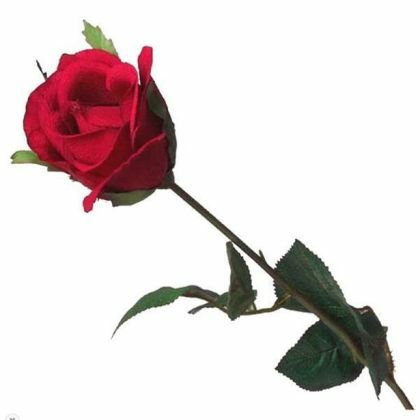 Luxury Long Stem Silk Red Rose - 59cm• Set the scene for a perfect party• Beautiful fabric rose • Measures 59cm long• Great decoration or costume accessoryClassically romantic, a single red rose is the perfect prop for Valentine’s Day. 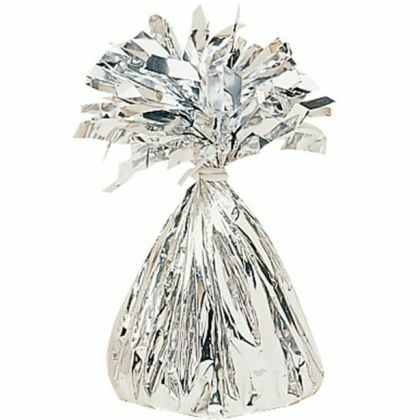 Lay it on your dinner table to set the scene for an intimate meal for two. 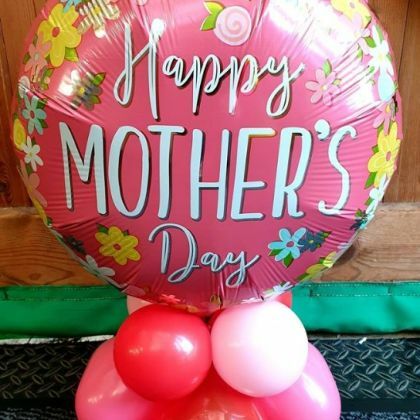 The soft fabric material creates beautifully realistic red petals and the long plastic stem has dark green leaves to add to the lifelike effect. 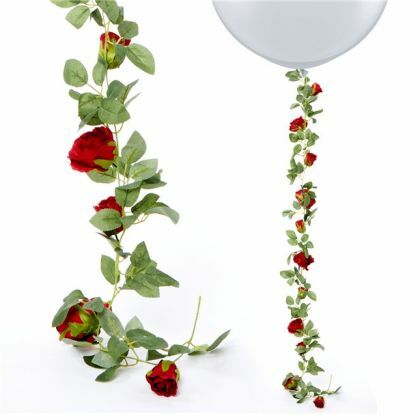 Red Rose Garland - 1.75mThis Red rose flower garland can add an amazing finish to your decorations, whether your using it to create stunning balloon tails or an addition to an amazing balloon arch, it will look beautiful! 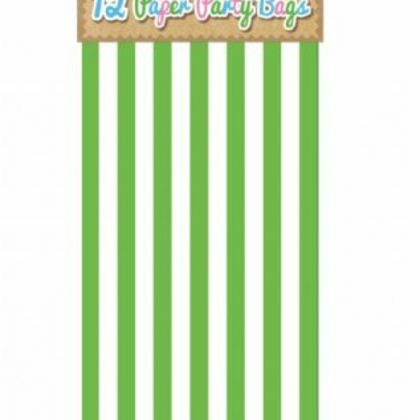 The garland measures approx 1.75m long. 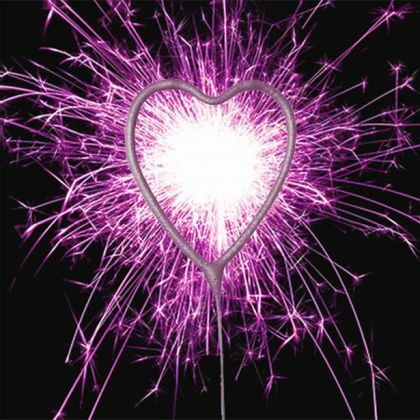 Pink Heart Sparkler• Set the scene for a perfect party• Heart shaped sparkler candle• Measures 17.8cm tall• Delivery to UK mainland onlyMake someone’s birthday extra-special by lighting this heart-shaped pink sparkler and popping it on top of the birthday cake! 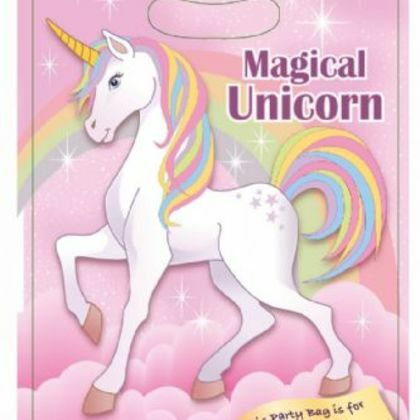 Everyone is sure to be delighted by the bright sparkling effect. 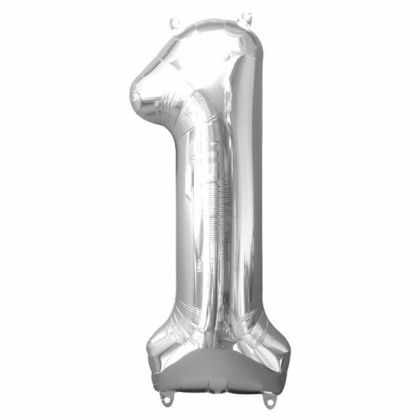 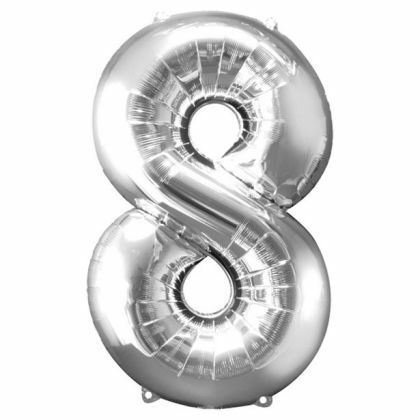 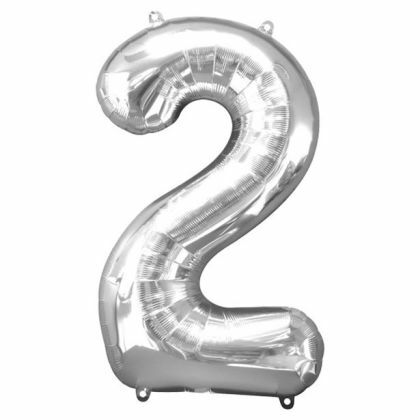 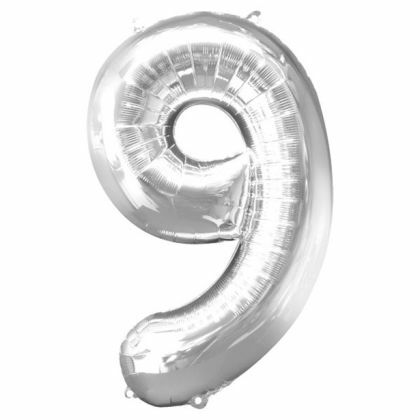 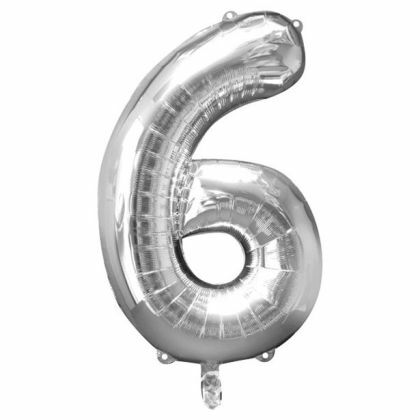 Silver Foil Balloon Weight - 170g• Weigh down bouquets of balloons• Fringed foil weight – 170g• Measures 12.7cm high• Holds up to 10 latex or 12 foil balloonsThis foil covered balloon weight has a pretty fringed finish – so it’d look great as a table centrepiece. 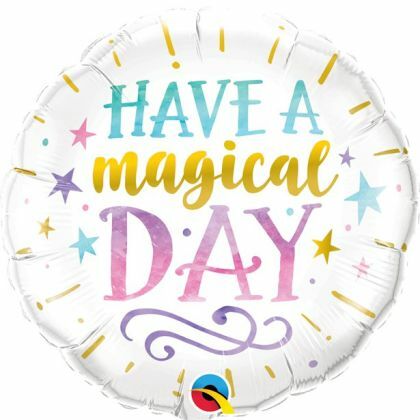 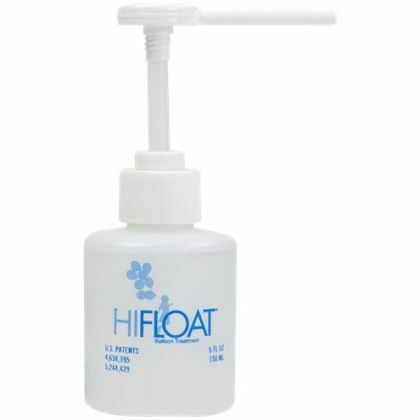 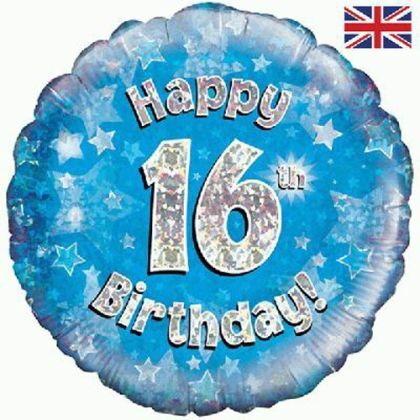 Tie your helium filled balloons together with coordinating ribbon and use this handy weight to stop them floating away! 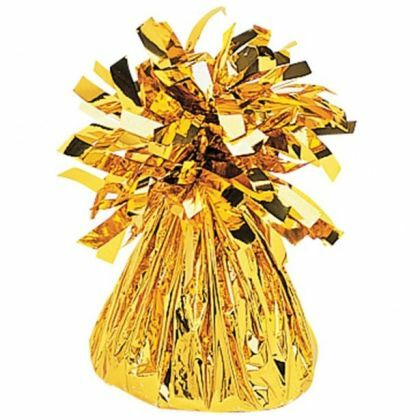 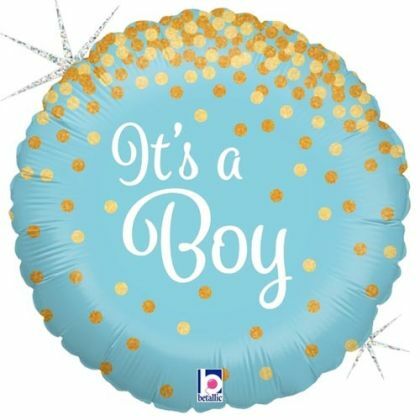 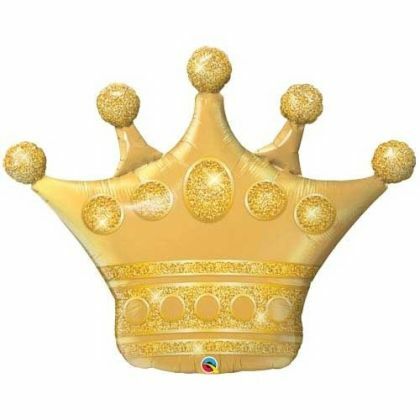 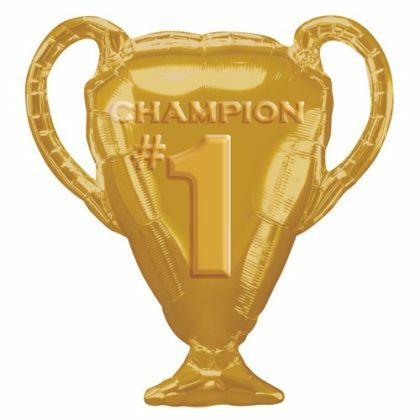 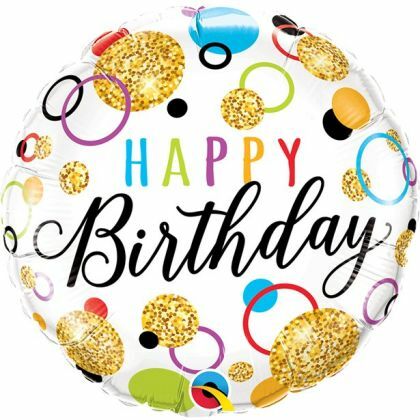 Gold Foil Balloon Weight - 170g• Weigh down bouquets of balloons• Fringed foil weight – 170g• Measures 12.7cm high• Holds up to 10 latex or 12 foil balloonsThis foil covered balloon weight has a pretty fringed finish – so it’d look great as a table centrepiece. Tie your helium filled balloons together with coordinating ribbon and use this handy weight to stop them floating away! 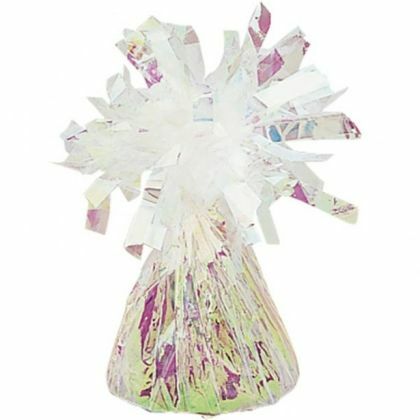 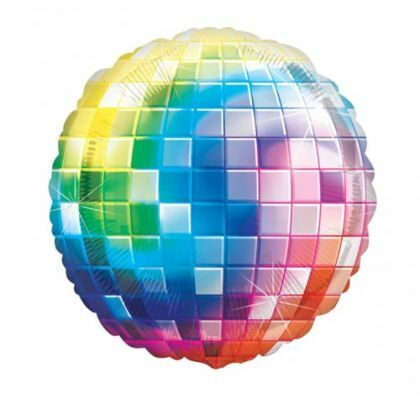 Iridescent Foil Balloon Weight - 170g• Weigh down bouquets of balloons• Fringed foil weight – 170g• Measures 12.7cm high• Holds up to 10 latex or 12 foil balloonsThis foil covered balloon weight has a pretty fringed finish – so it’d look great as a table centrepiece. 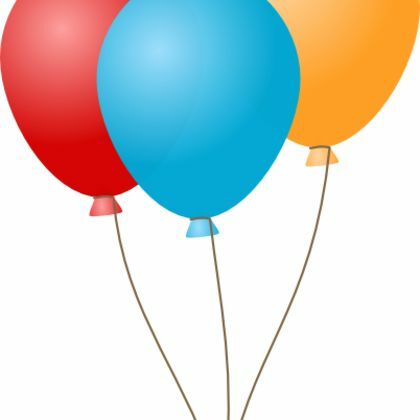 Tie your helium filled balloons together with coordinating ribbon and use this handy weight to stop them floating away! 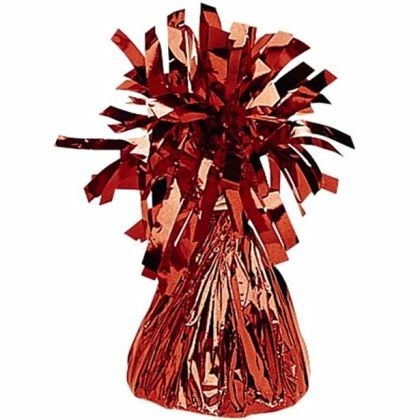 Red Foil Balloon Weight - 170g• Weigh down bouquets of balloons• Fringed foil weight – 170g• Measures 12.7cm high• Holds up to 10 latex or 12 foil balloonsThis foil covered balloon weight has a pretty fringed finish – so it’d look great as a table centrepiece. 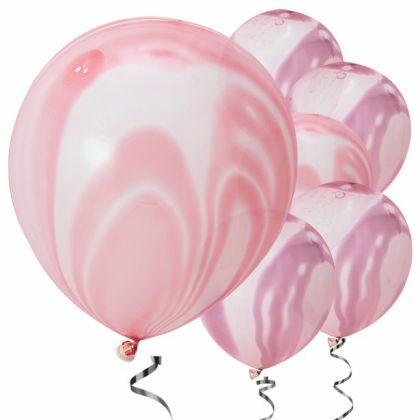 Tie your helium filled balloons together with coordinating ribbon and use this handy weight to stop them floating away! 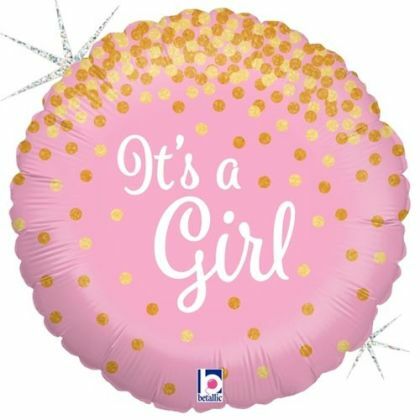 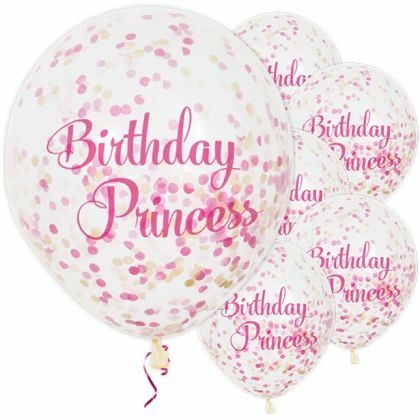 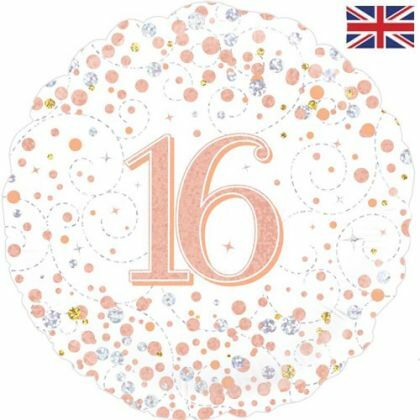 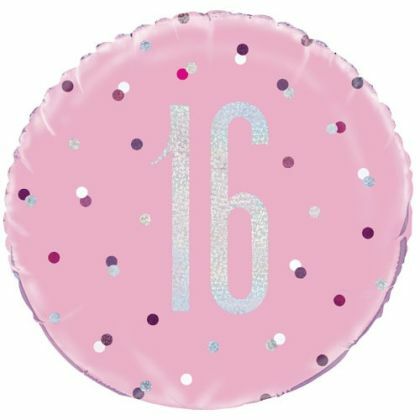 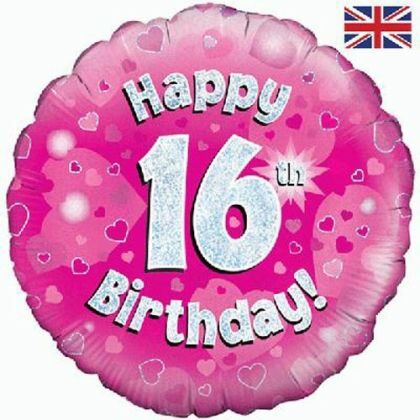 Light pink Foil Balloon Weight - 170g• Weigh down bouquets of balloons• Fringed foil weight – 170g• Measures 12.7cm high• Holds up to 10 latex or 12 foil balloonsThis foil covered balloon weight has a pretty fringed finish – so it’d look great as a table centrepiece. Tie your helium filled balloons together with coordinating ribbon and use this handy weight to stop them floating away! 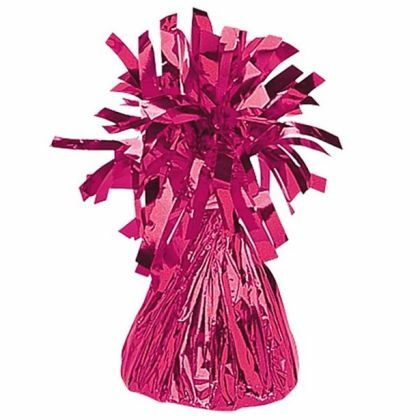 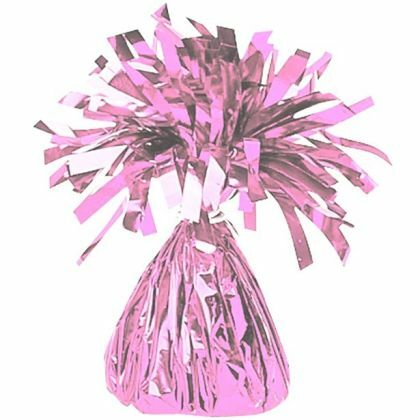 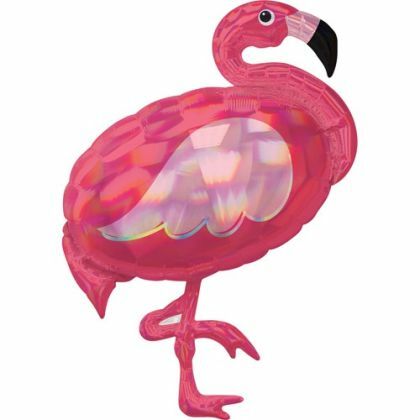 Magenta Foil Balloon Weight - 170g• Weigh down bouquets of balloons• Fringed foil weight – 170g• Measures 12.7cm high• Holds up to 10 latex or 12 foil balloonsThis foil covered balloon weight has a pretty fringed finish – so it’d look great as a table centrepiece. 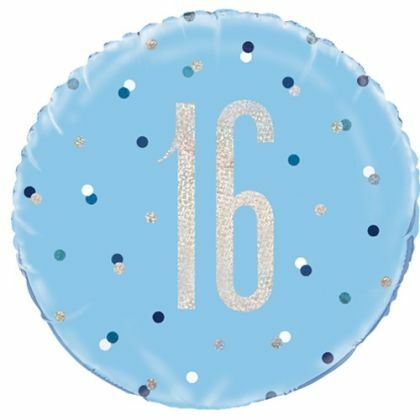 Tie your helium filled balloons together with coordinating ribbon and use this handy weight to stop them floating away! Purple Foil Balloon Weight - 170g• Weigh down bouquets of balloons• Fringed foil weight – 170g• Measures 12.7cm high• Holds up to 10 latex or 12 foil balloonsThis foil covered balloon weight has a pretty fringed finish – so it’d look great as a table centrepiece. Tie your helium filled balloons together with coordinating ribbon and use this handy weight to stop them floating away! 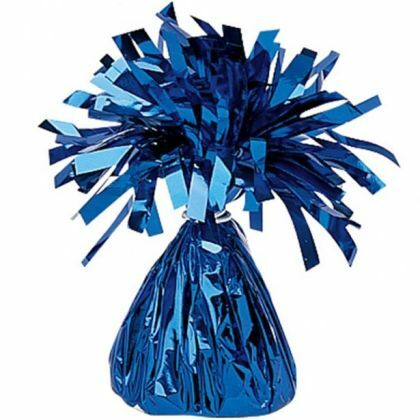 Blue Foil Balloon Weight - 170g• Weigh down bouquets of balloons• Fringed foil weight – 170g• Measures 12.7cm high• Holds up to 10 latex or 12 foil balloonsThis foil covered balloon weight has a pretty fringed finish – so it’d look great as a table centrepiece. Tie your helium filled balloons together with coordinating ribbon and use this handy weight to stop them floating away! 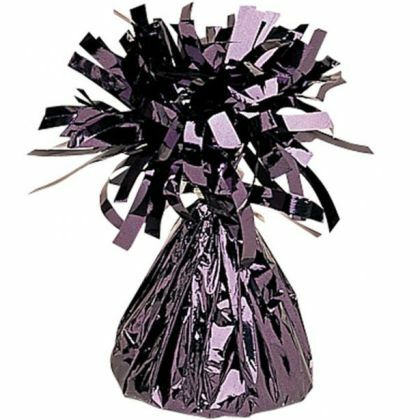 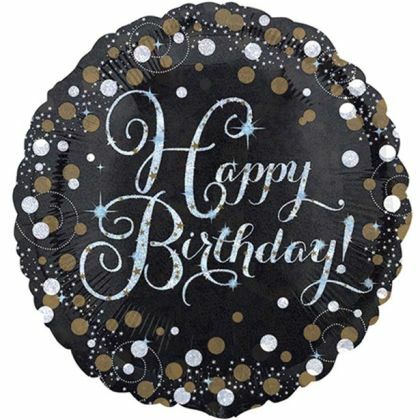 Black Foil Balloon Weight - 170g• Weigh down bouquets of balloons• Fringed foil weight – 170g• Measures 12.7cm high• Holds up to 10 latex or 12 foil balloonsThis foil covered balloon weight has a pretty fringed finish – so it’d look great as a table centrepiece. 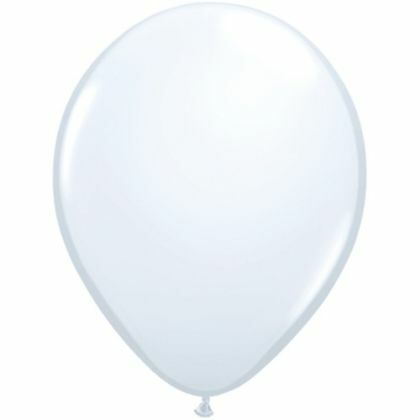 Tie your helium filled balloons together with coordinating ribbon and use this handy weight to stop them floating away! 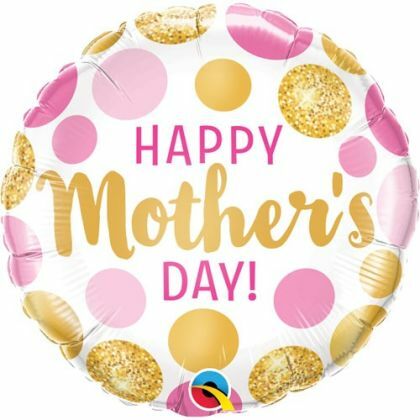 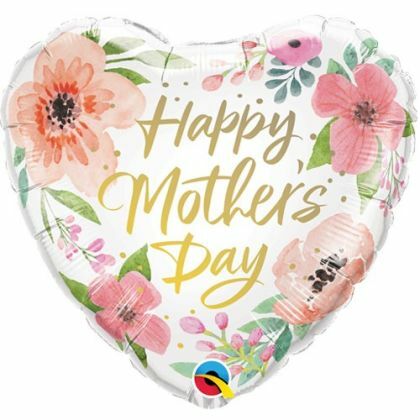 Mother's Day gift boxA great gift to show your appreciation for all the hard work Mum does!Contains:- 18 inch helium inflated balloon (supplied with a star weight)- Amazing Mum rossette- Small bag of sweets- All in a lovely gift boxOrder now to guarantee yours! 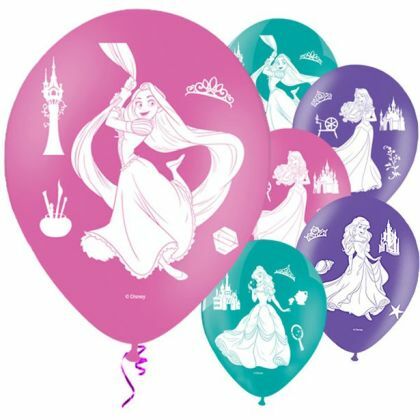 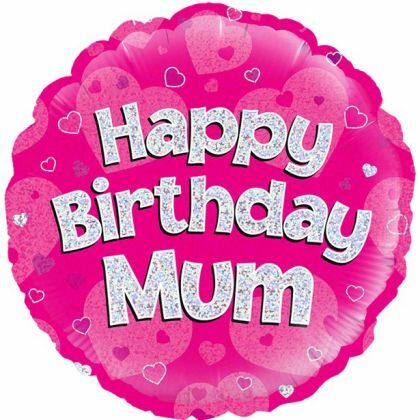 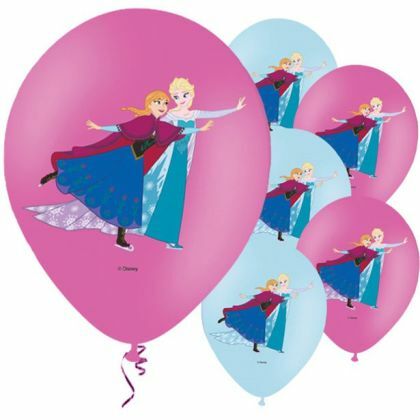 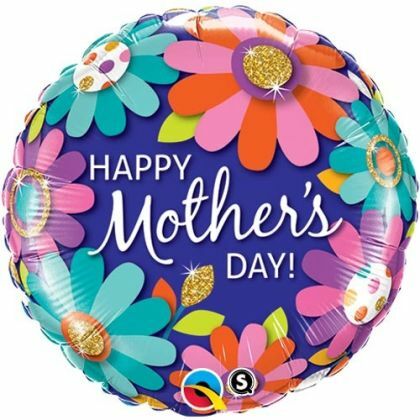 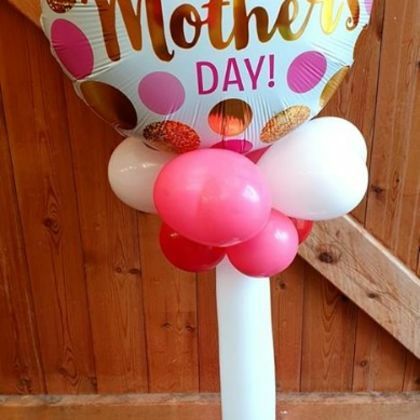 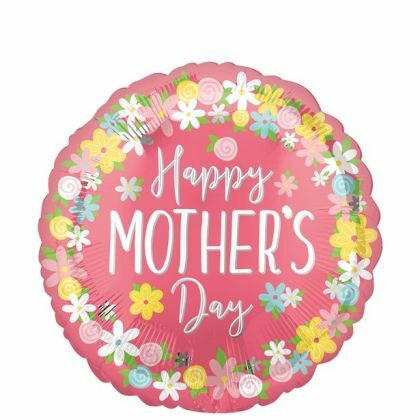 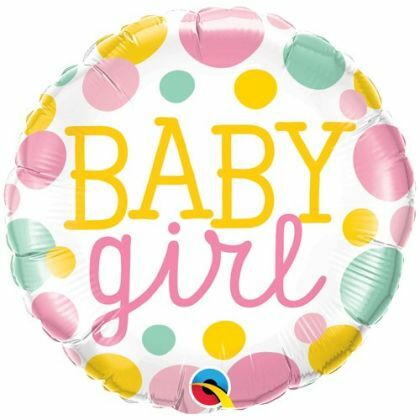 A great mothers day balloon mini Display These need to be ordered by Wednesday 27th March and will be ready to collect on Saturday 30th or Sunday 31st. 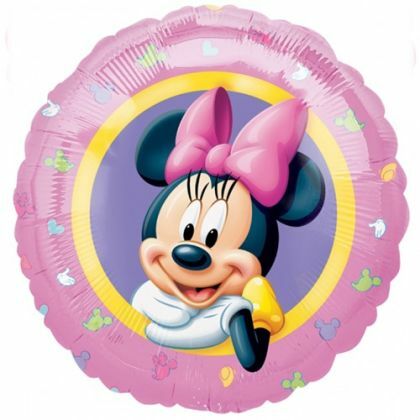 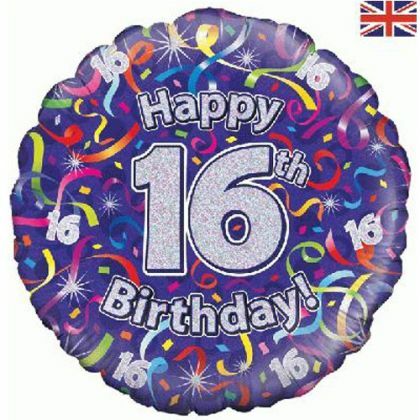 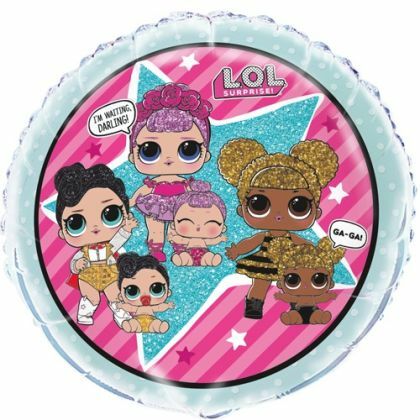 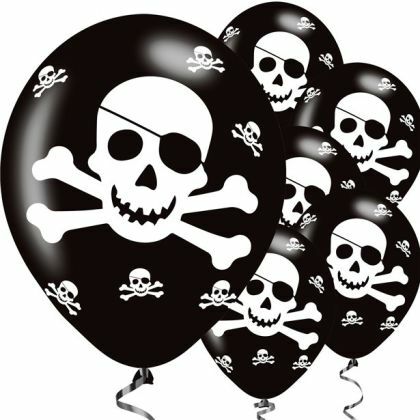 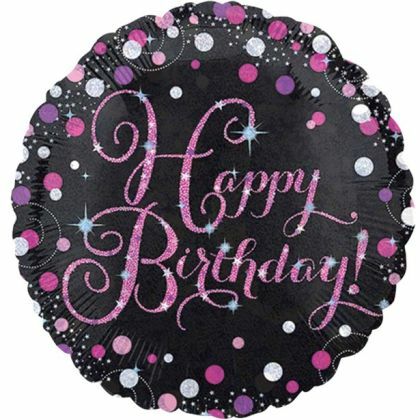 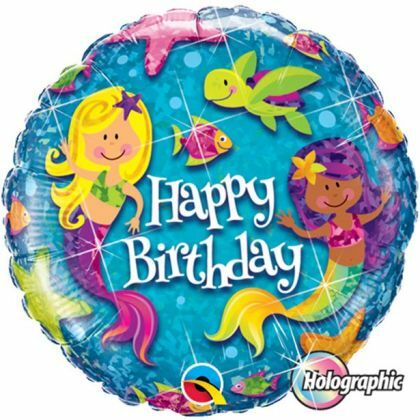 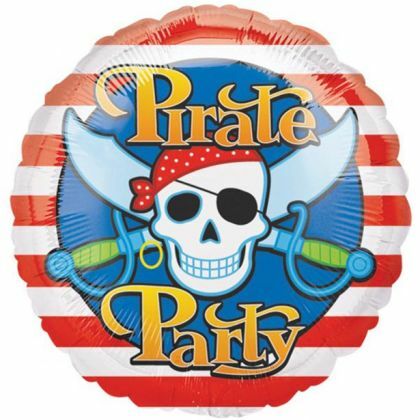 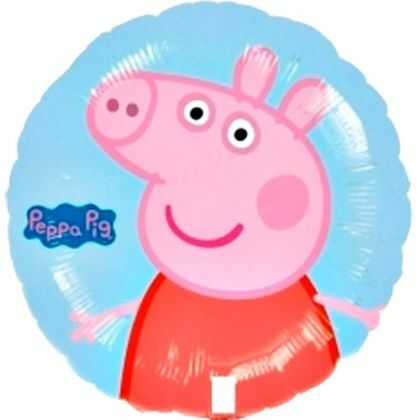 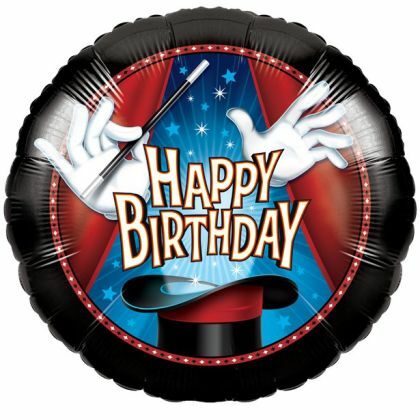 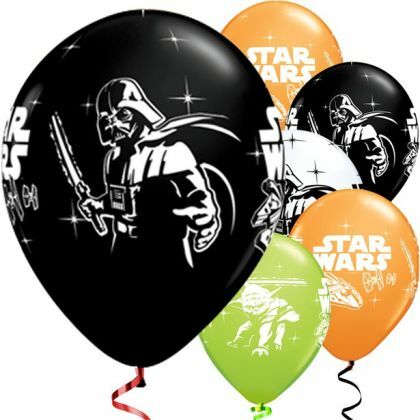 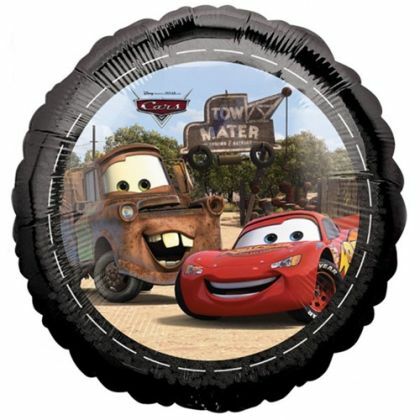 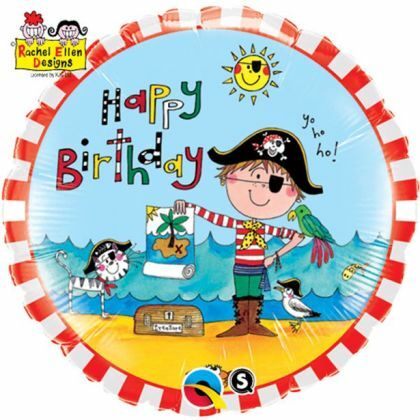 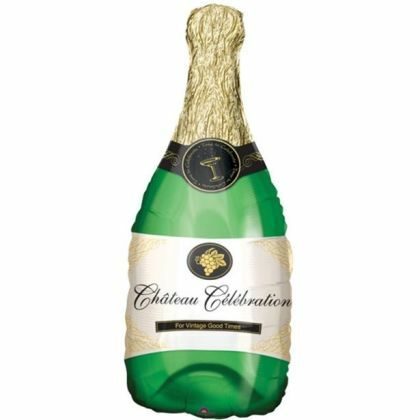 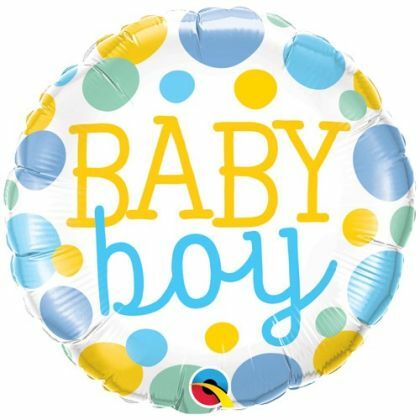 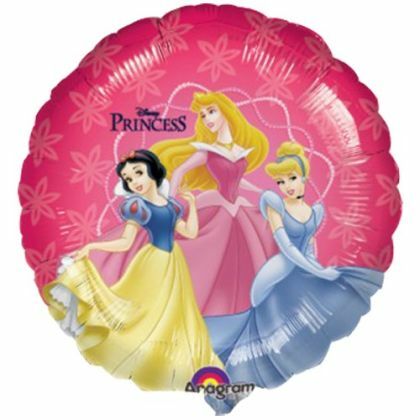 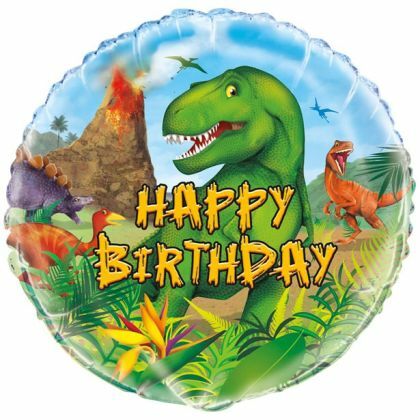 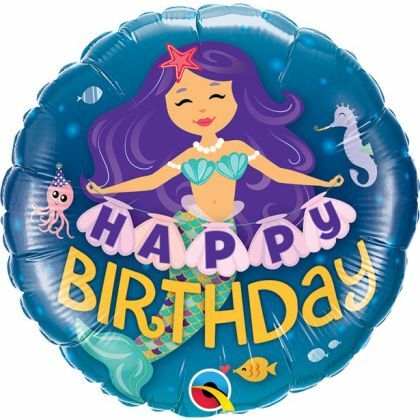 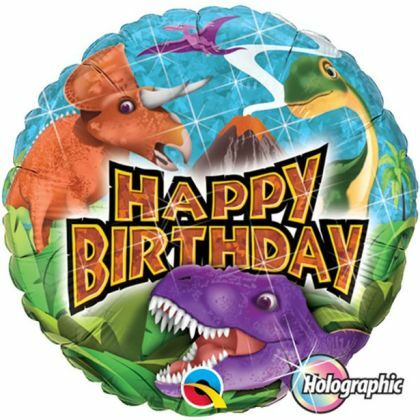 The round foil balloon can be changed to any of the ones we have in stock. 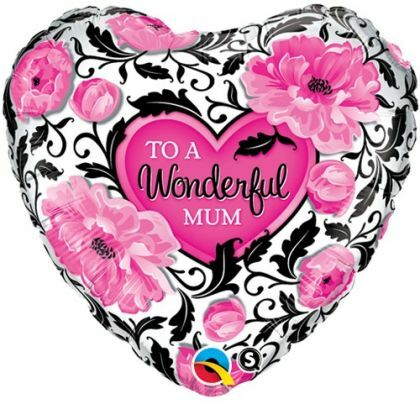 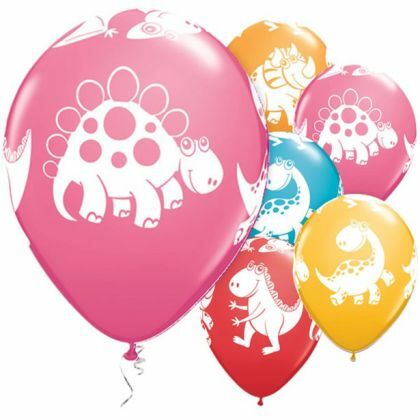 A great mothers day balloon Column These need to be ordered by Wednesday 27th March and will be ready to collect on Saturday 30th or Sunday 31st. 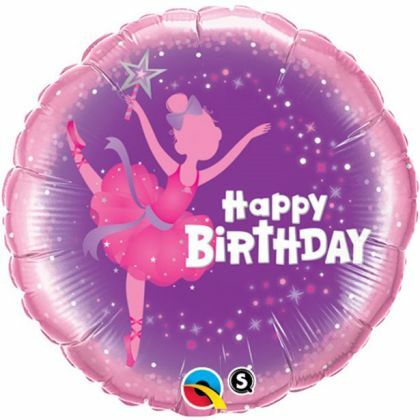 The round foil balloon can be changed to any of the ones we have in stock. 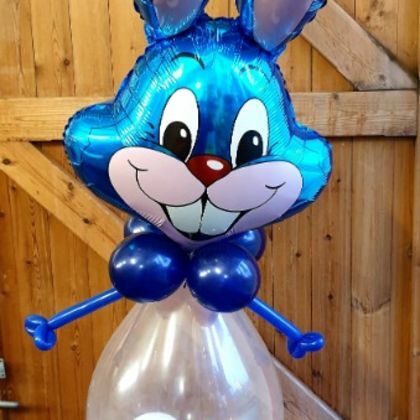 Who wants a visit from the Easter bunny?You can have your very own Easter bunny at home - or maybe even use as a display for an Easter party or event.Our Easter bunnies are available in blue or pink and are made wholly from balloons - standing approximately 150cm tall.The "belly" of the bunny can also be customised as required to include sweets or a teddy - at an extra cost. 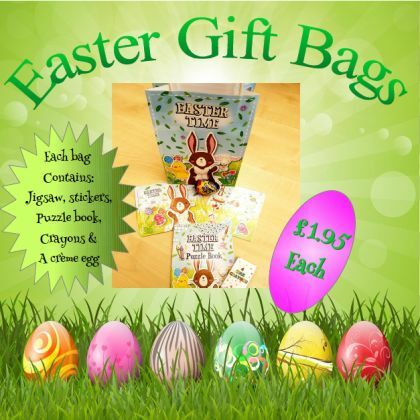 Get in touch for details of this. 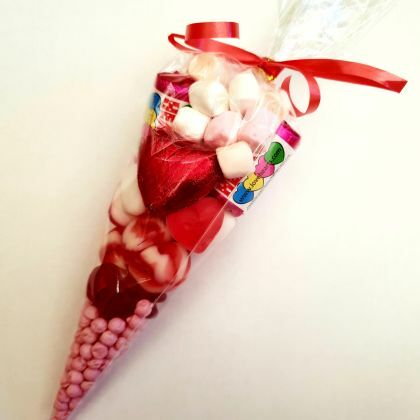 Easter Sweet conesFed up with chocolate eggs? 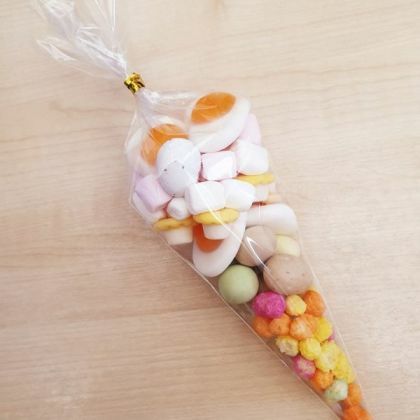 Give a sweet cone instead!Packed full of great sweets, including chocolate mini eggs and jelly fried eggs! 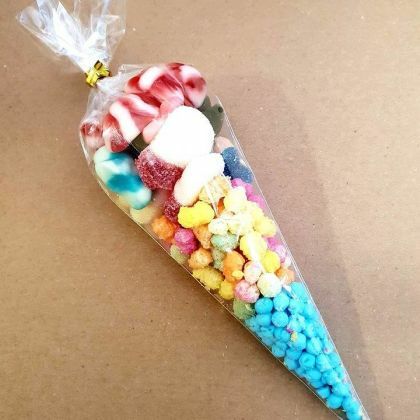 These cones are bright and colourful. 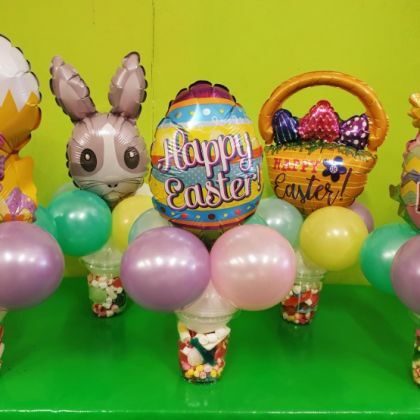 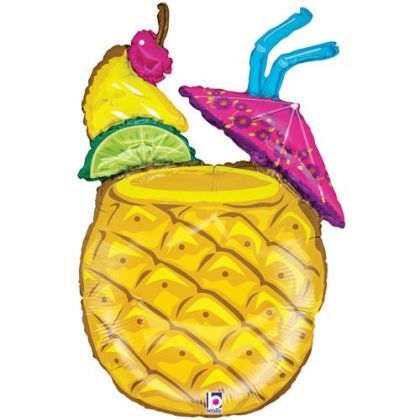 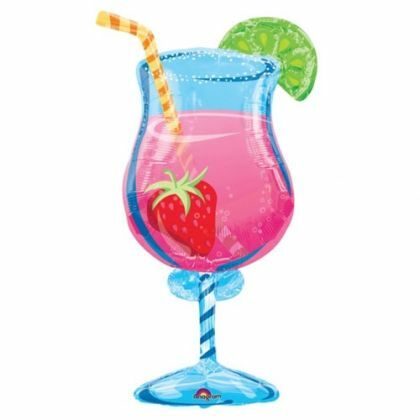 Easter Candy cupsA 12oz cup filled with an assortment of sweets, topped off with a great Easter balloon display. 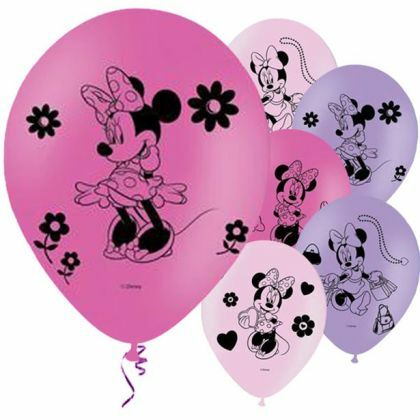 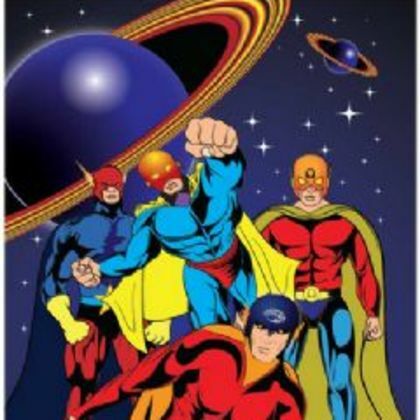 Available in 5 great designs.